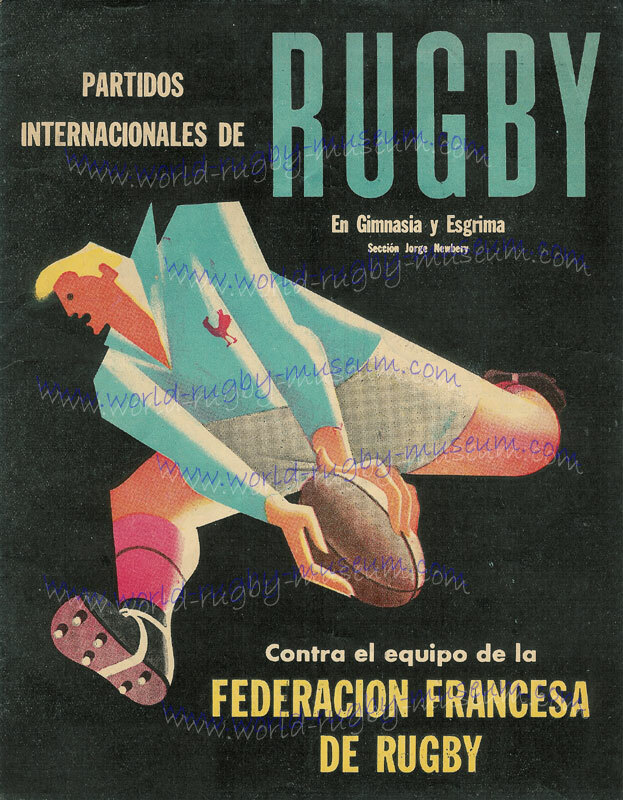 Argentina v France 1949 modern reproduction quality match poster with superb illustration, size A2 (59.4cm x 42cm = 23.4" x 16.5") in excellent condition, ideal for framing. 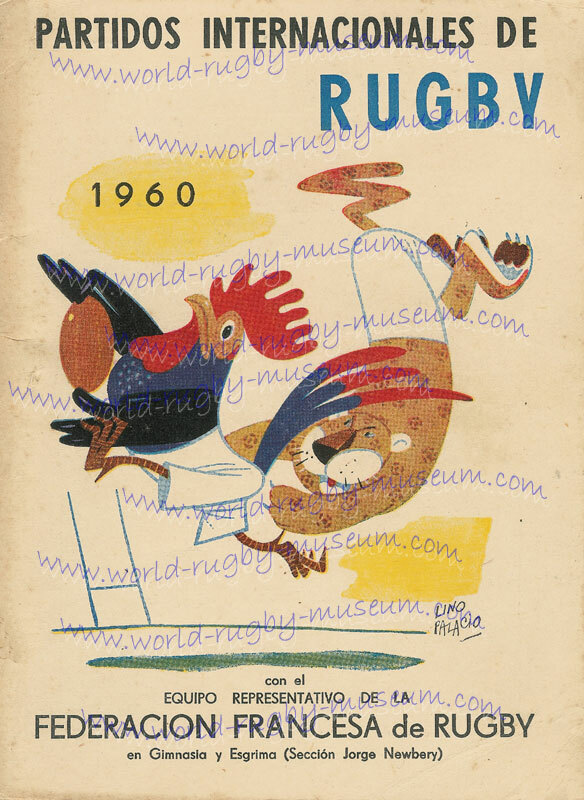 Argentina v France 1960 modern reproduction quality match poster with superb illustration, size A2, 59.4cm x 42cm = 23.4" x 16.5" in excellent condition, ideal for framing. 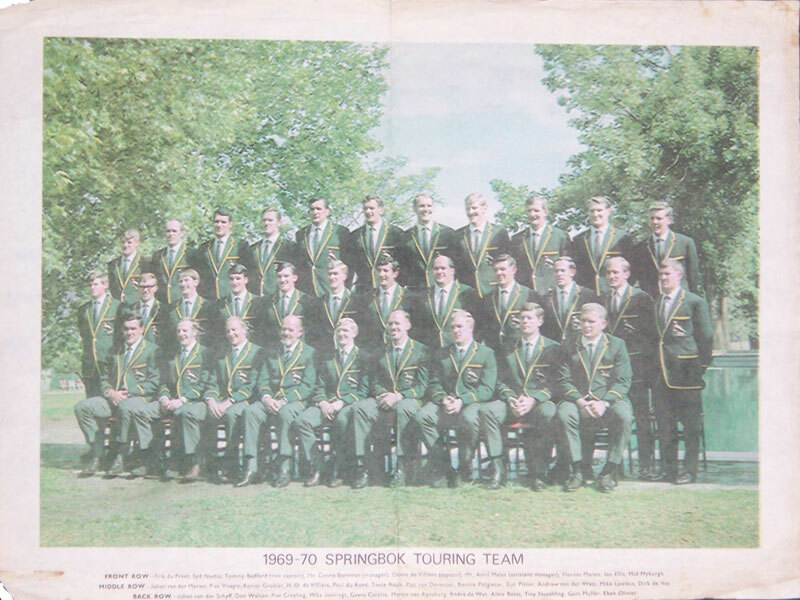 Junior Springboks tour of Argentina 1959 modern reproduction quality match poster with superb illustration, size A2 (59.4cm x 42cm = 23.4" x 16.5") in excellent condition, ideal for framing. 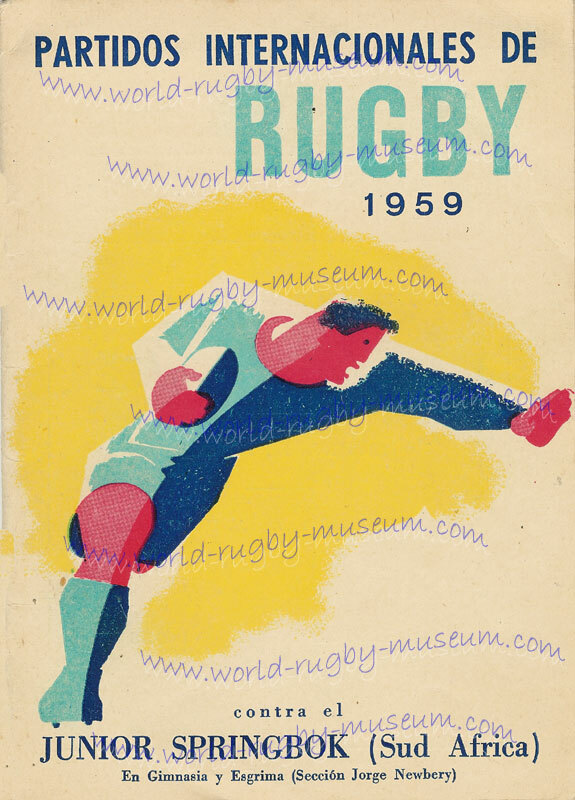 A group of 3 Argentina modern reproduction quality match posters with superb illustrations, size A2 (59.4cm x 42cm = 23.4" x 16.5") all 3 are in excellent condition, ideal for framing, the posters in this collection are as follows Argentina v France 1949, Argentina v France 1960 & Junior Springboks tour of Argentina 1959. 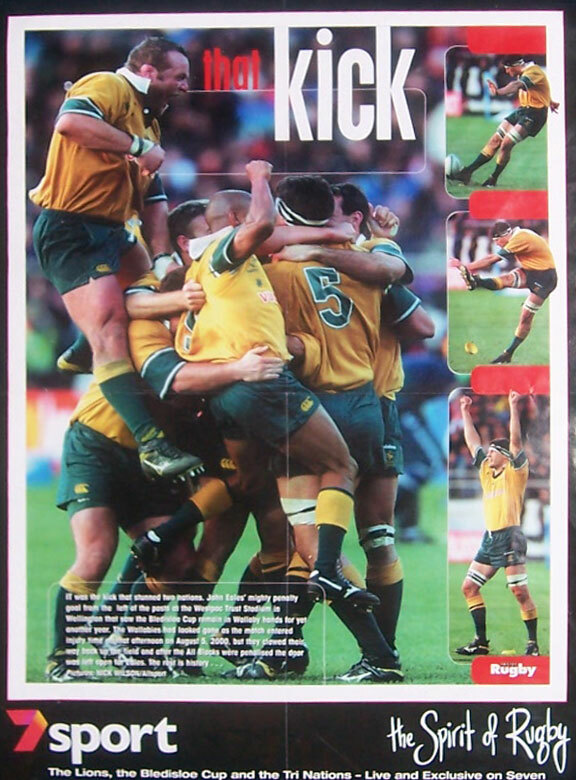 "That Kick" - the story and photographs of John Eales mighty penalty against the All Blacks in Wellington 2000. folded, size, A2, 20" x 15" - 51 x 37cm. 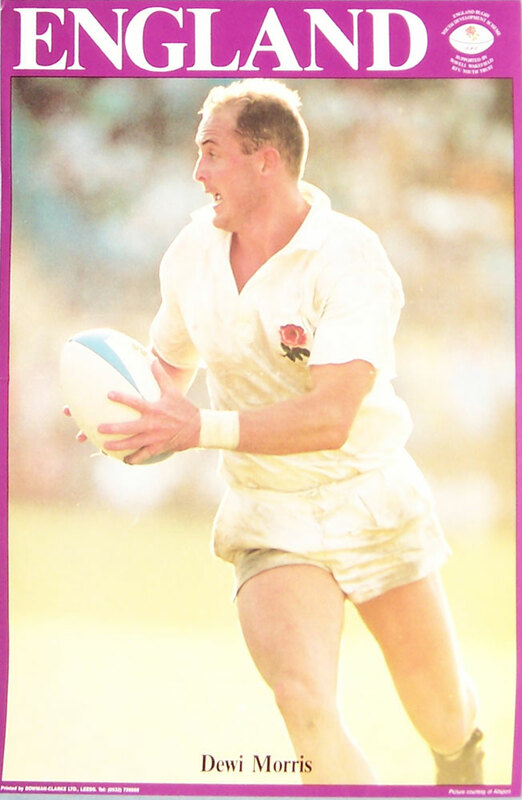 Simon Poidevin, Australia, Rugby World & Post player profile series, size A3, 42cm x 29.7cm = 16.5" x 11.7, folded. 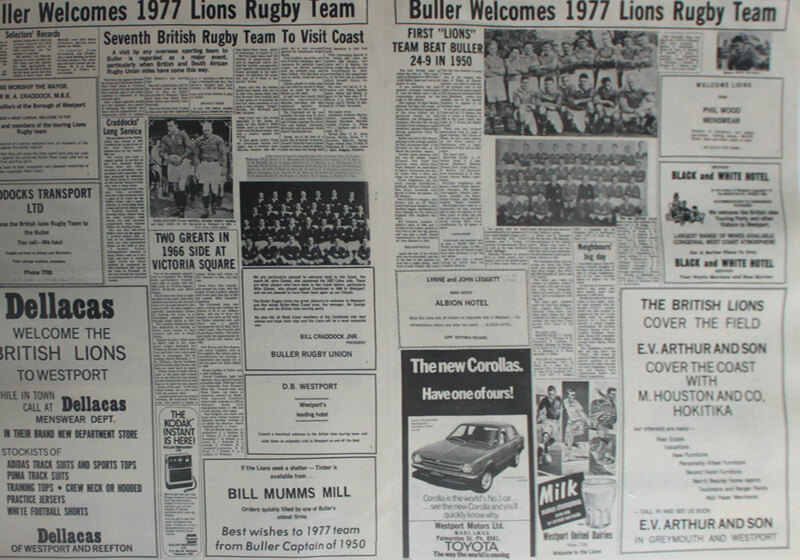 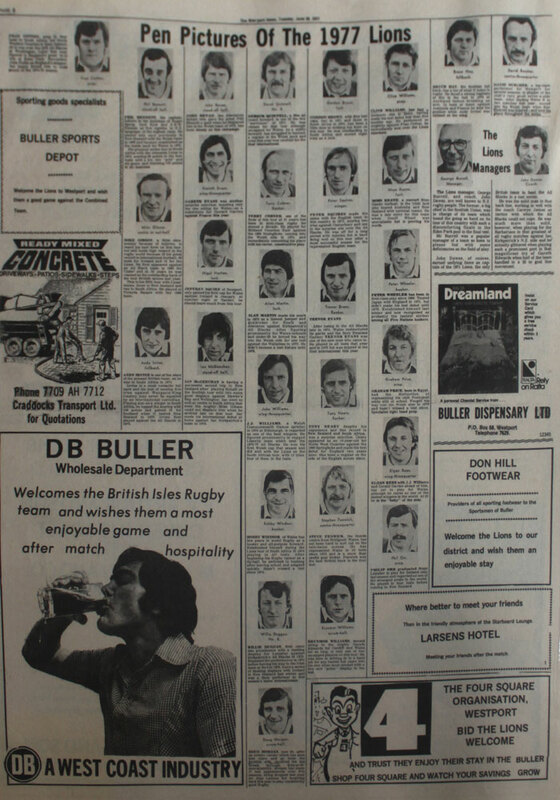 Westport News, 1977 Lions special newspaper laminated, double sided including a full page of player photos and profiles. 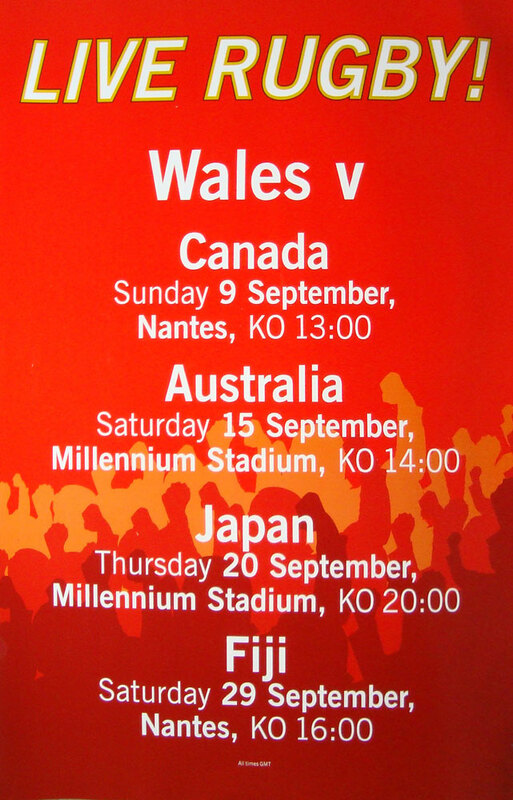 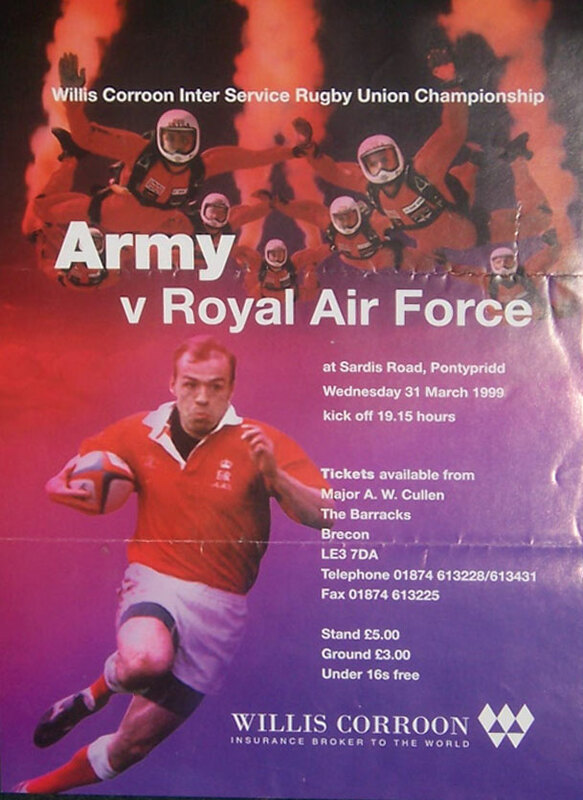 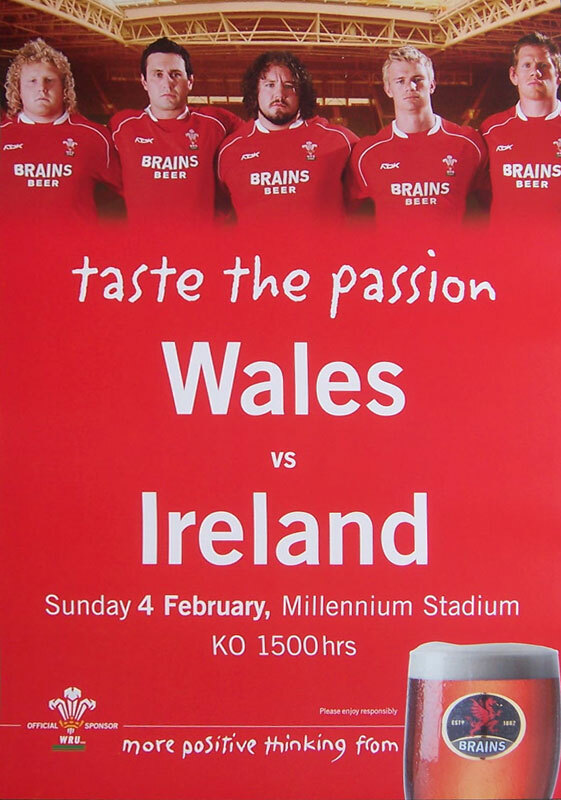 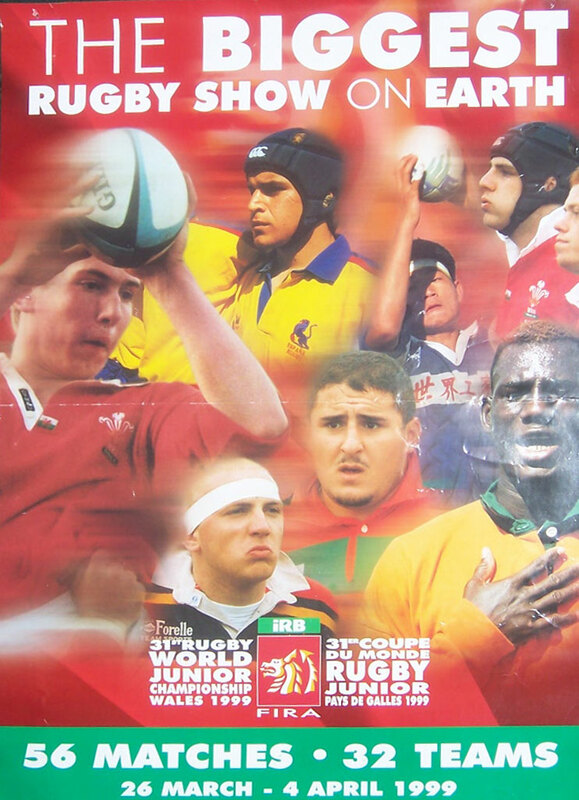 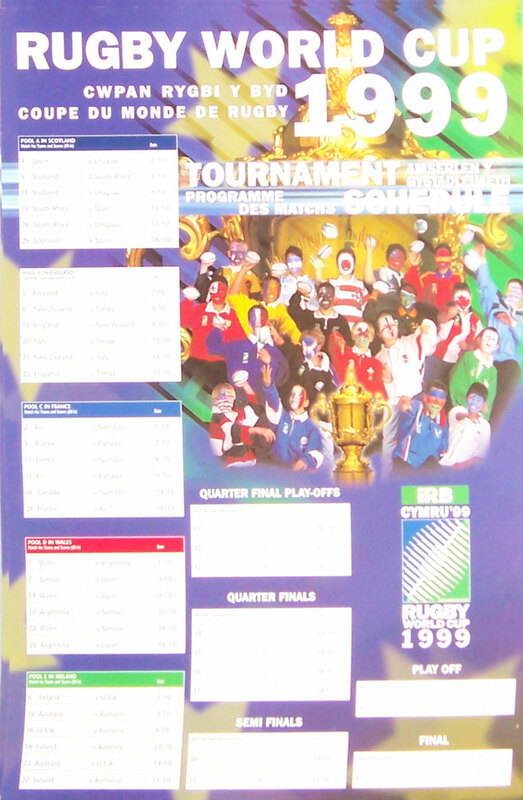 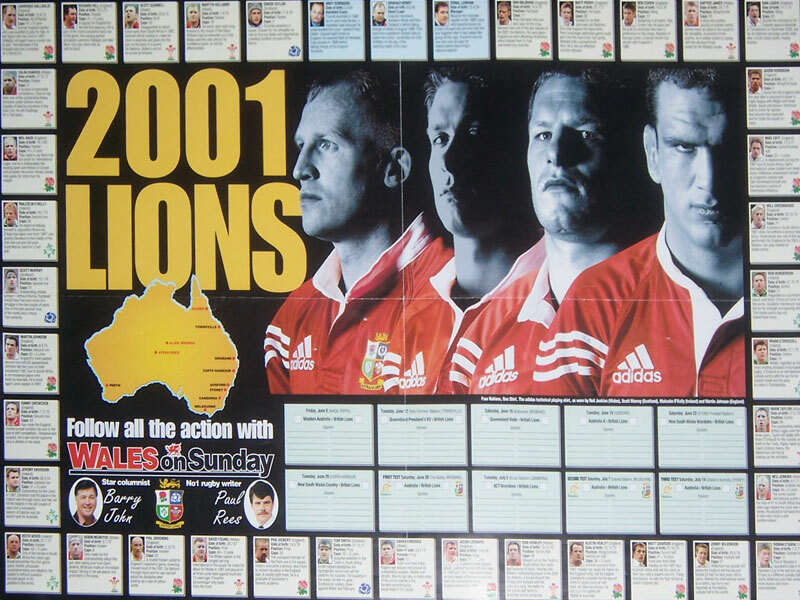 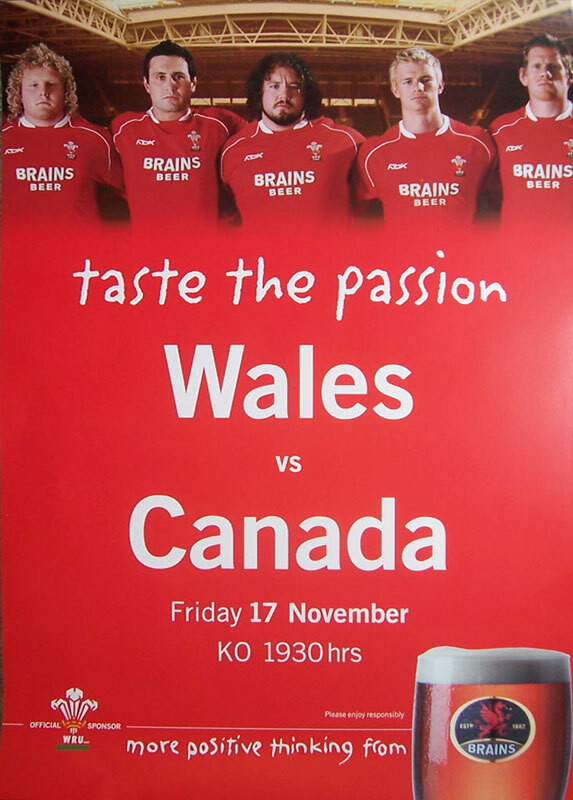 Lions 2001 - pre tour poster issued by Wales on Sunday, includes Lions profiles and photos and tour itinerary, total size 23" x 16" - 58 x 41cm, folding creases. 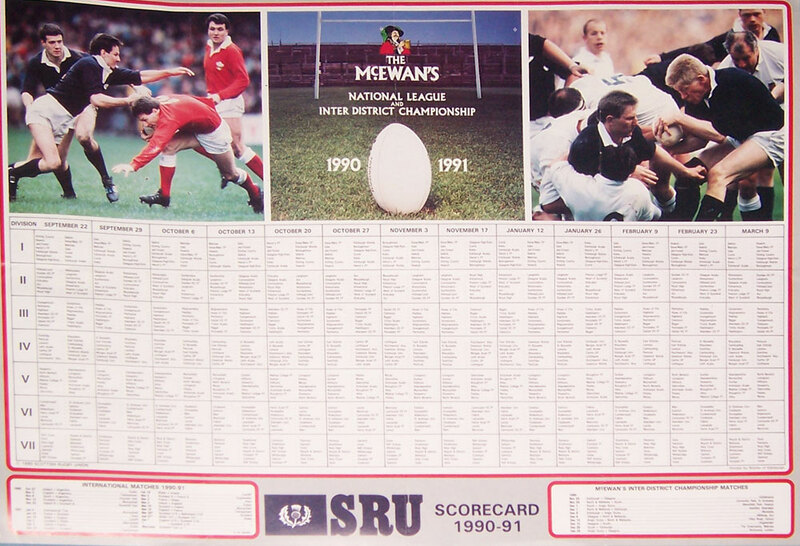 Sunday Times 1960-61 fixtures wall chart, slightly under A3 size, folded across the centre. 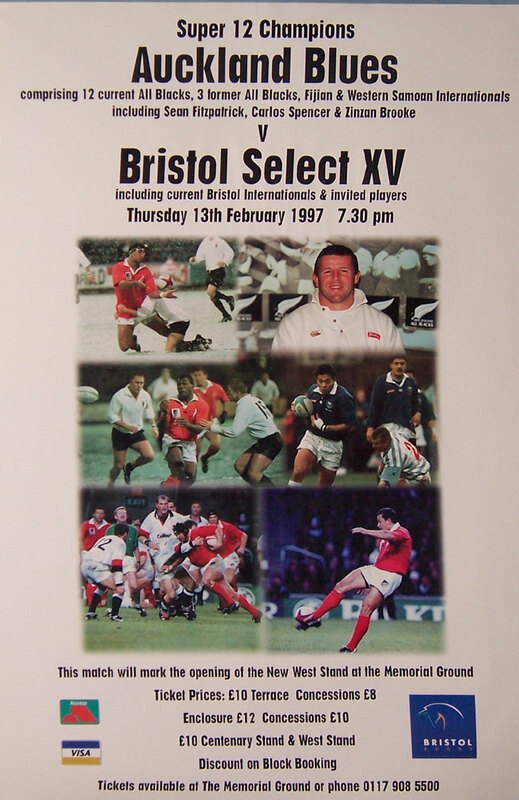 Bristol Select XV v Auckland Blues 13 Feb 1997, a match to celebrate opening of new stand - action photos, a slightly larger than A2 poster, approx 36" x 24", 92cm x 61cm. 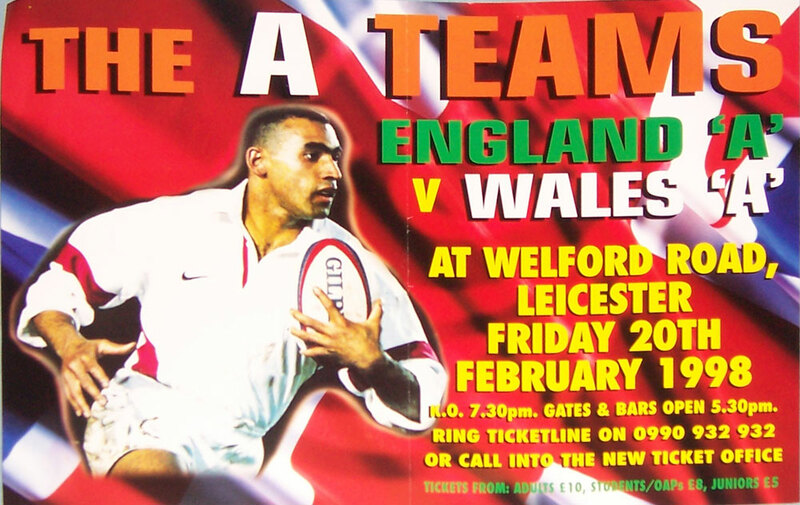 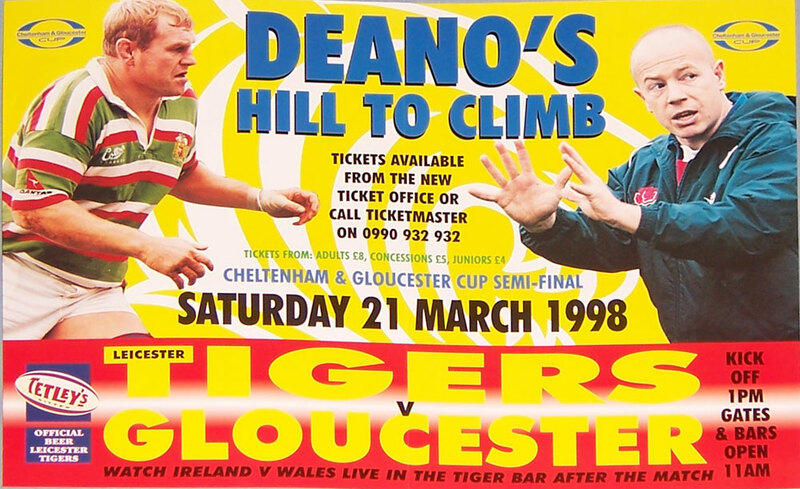 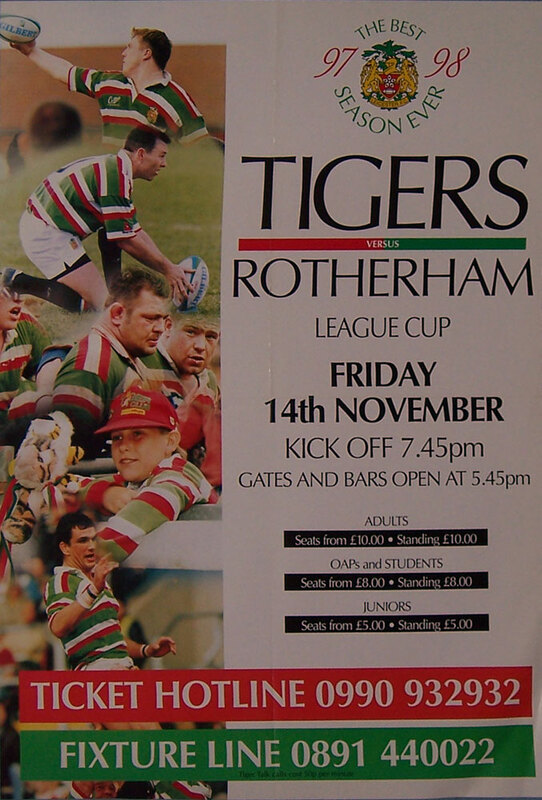 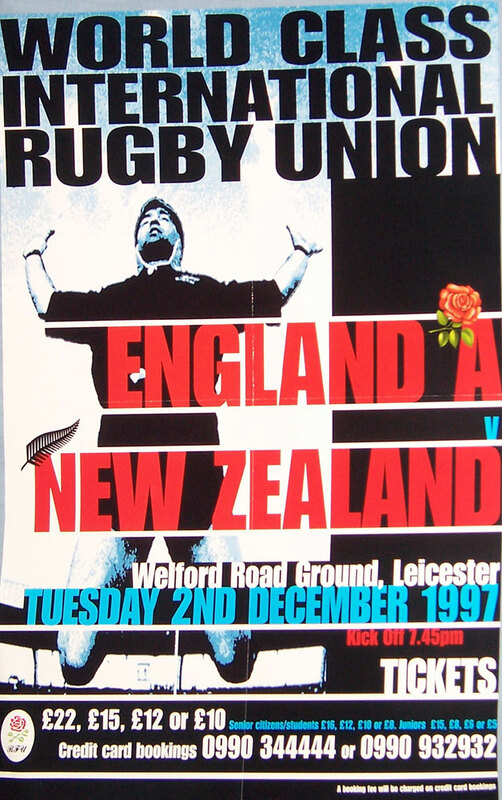 Leicester v Rotherham 1997 - pre-match advertising poster, size A2, 59.4cm x 42cm = 23.4" x 16.5"
Dewi Morris, RFU player poster, size A3, 42cm x 29.7cm = 16.5" x 11.7, folded. 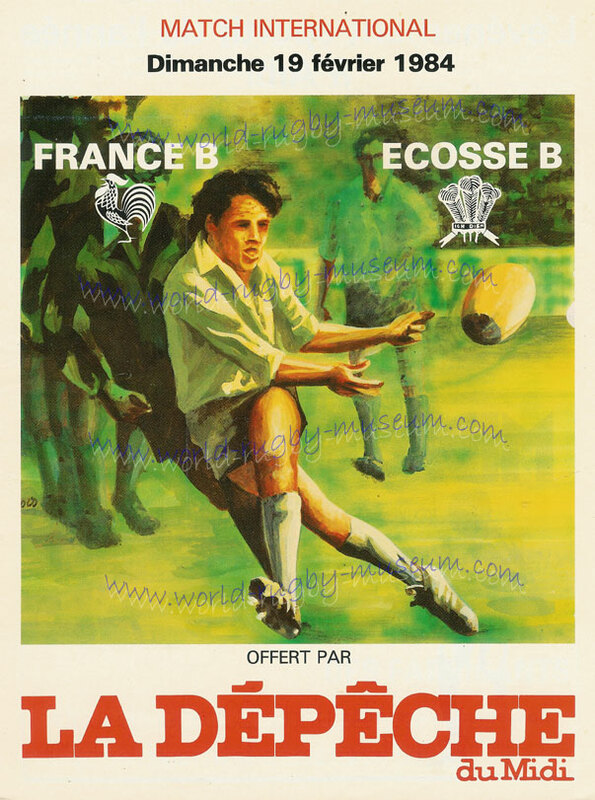 France B v Scotland B 1984 modern reproduction quality match poster with a nice illustration, size A2 (59.4cm x 42cm = 23.4" x 16.5") in excellent condition, ideal for framing. 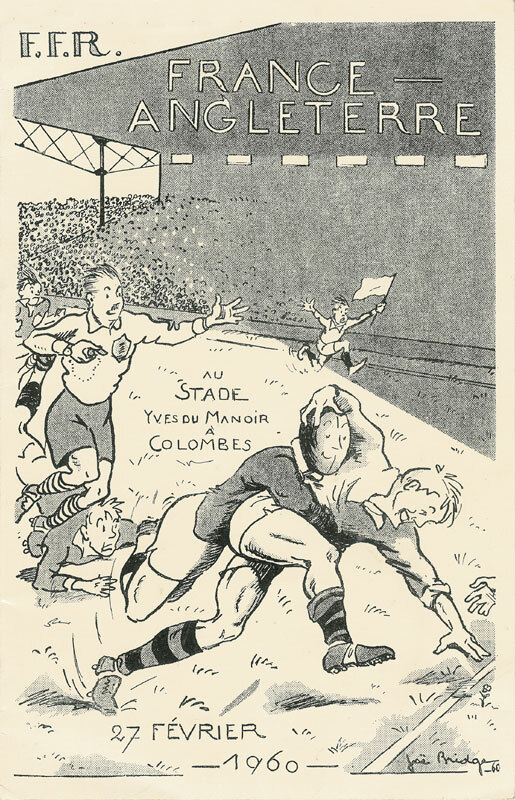 France v England 1960 modern reproduction quality comical illustration by Joe Bridges relating to this match. 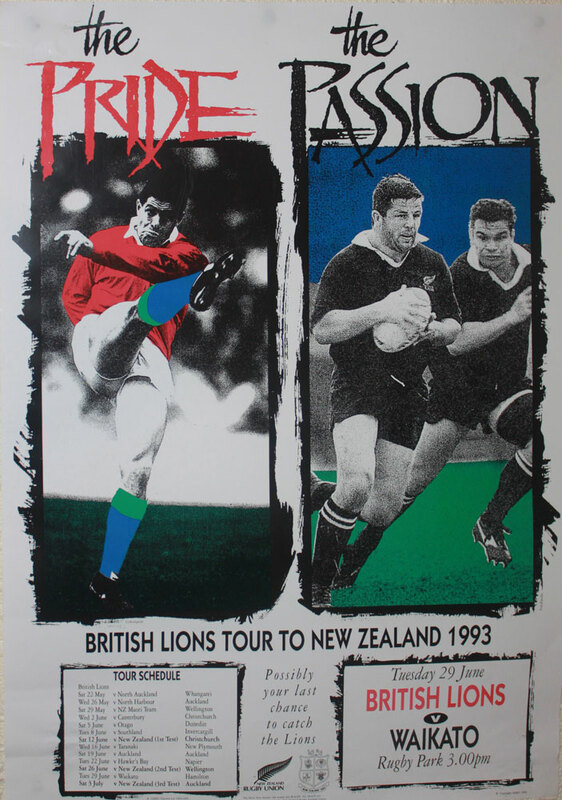 A nice illustration, size A2 (59.4cm x 42cm = 23.4" x 16.5") in excellent condition, ideal for framing. 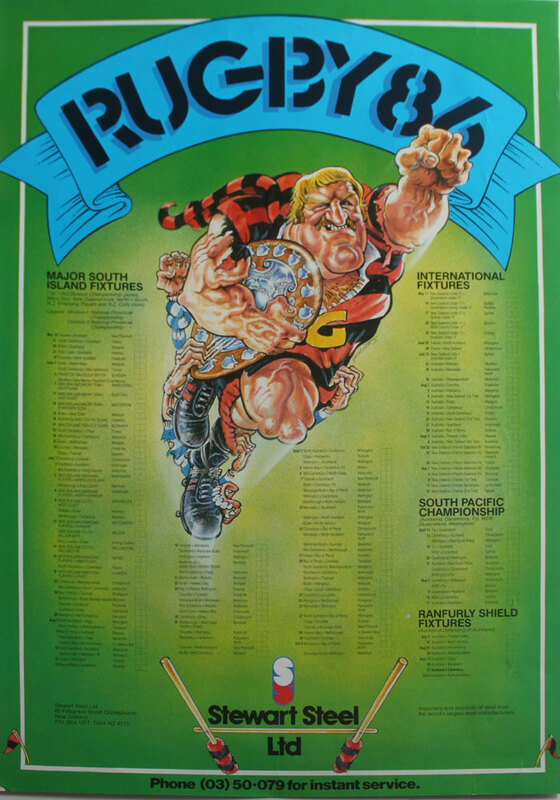 Stewart Steel - Rugby '86 fixture list, large caricature of Grizz Wyllie, size A2, 59.4cm x 42cm = 23.4" x 16.5". 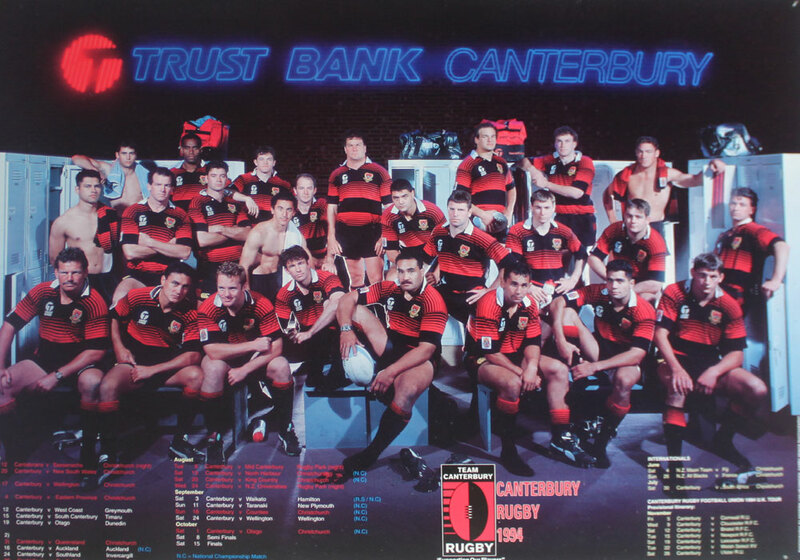 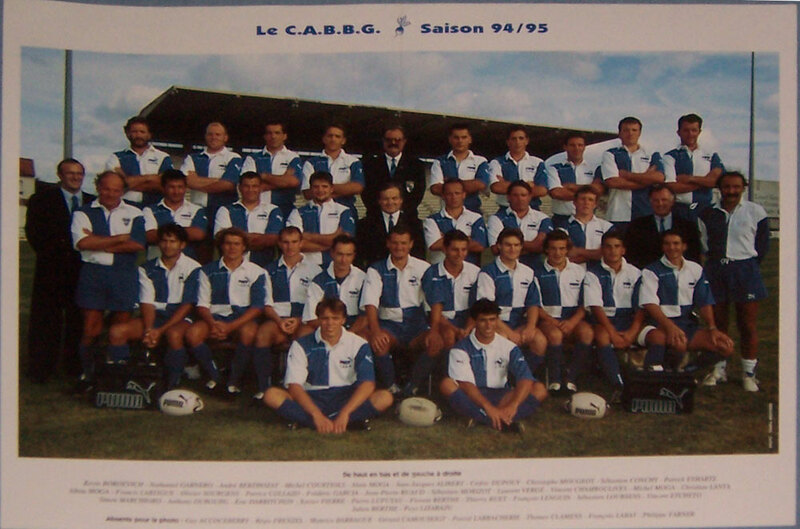 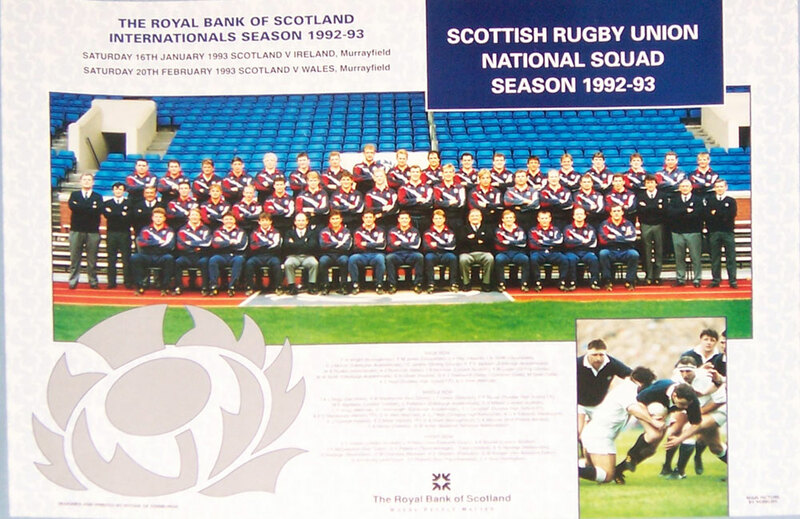 Canterbury Rugby '94, squad poster & fixture list (58 X 38). 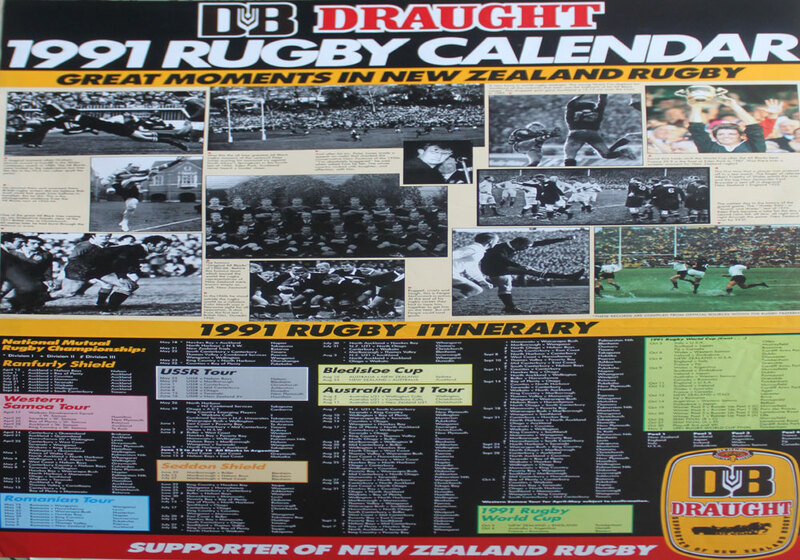 DB-NZ 1991 Rugby calendar & fixture list, includes photos of great moments in NZ rugby, size - 68cm x 48cm, folded. 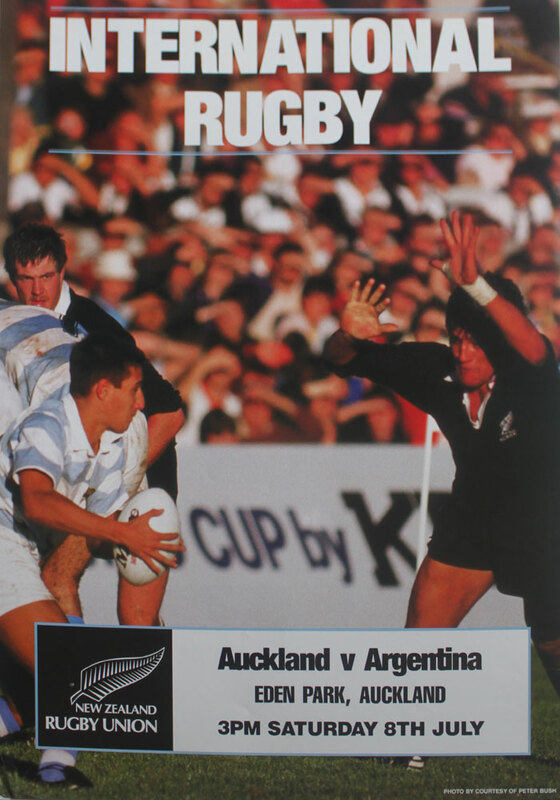 Auckland v Argentina 1990 match advertising poster, photo of an Argentina tour of New Zealand match with match information in a text box near the bottom, size 60cm x 42cm. 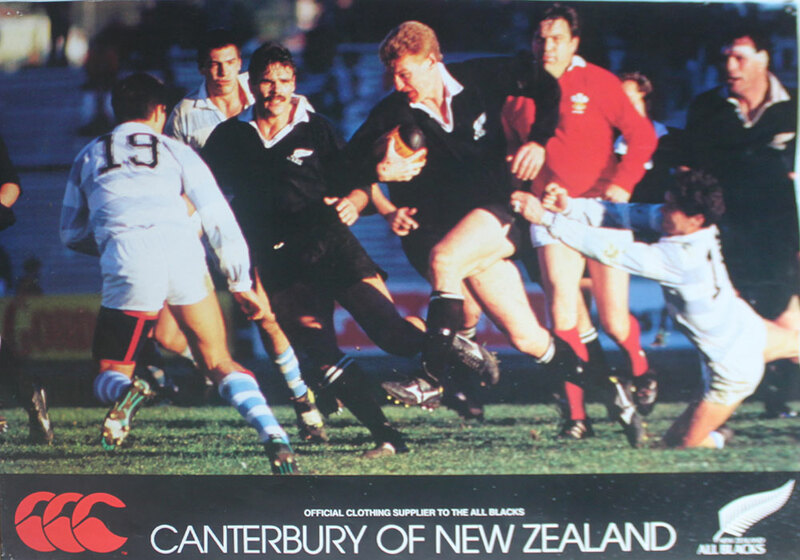 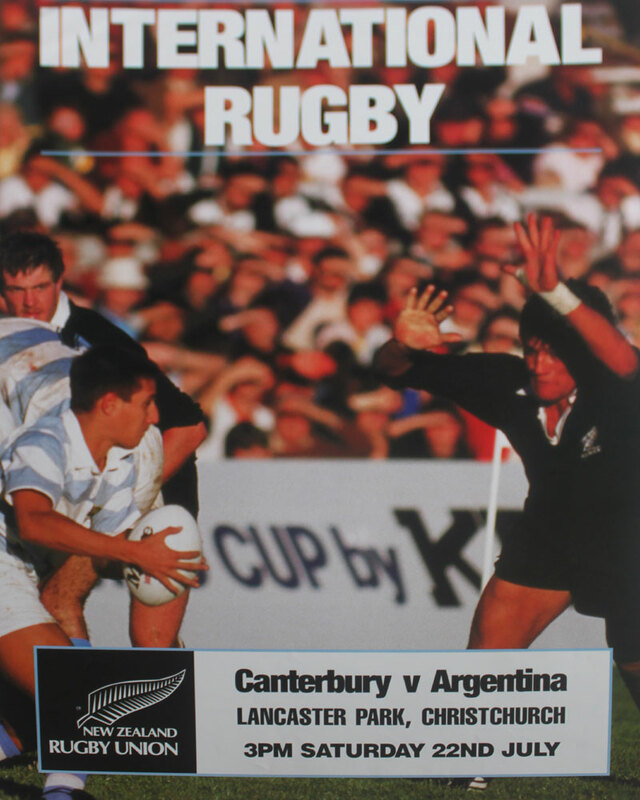 Canterbury v Argentina 1990 match advertising poster, photo of an Argentina tour of New Zealand match with match information in a text box near the bottom, size A2, 60cm x 42cm. 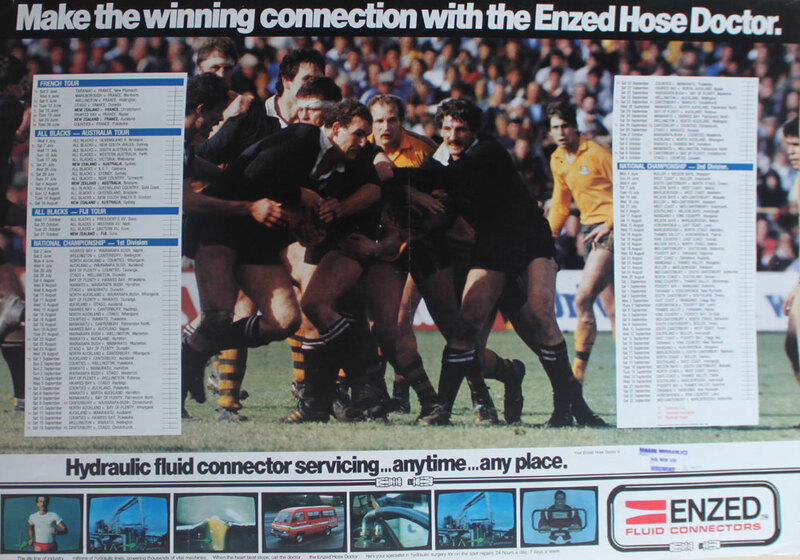 ENZED Fluid Connectors, advertising poster with large All Blacks scene & fixtures 1989, size A2, 59.4cm x 42cm = 23.4" x 16.5". 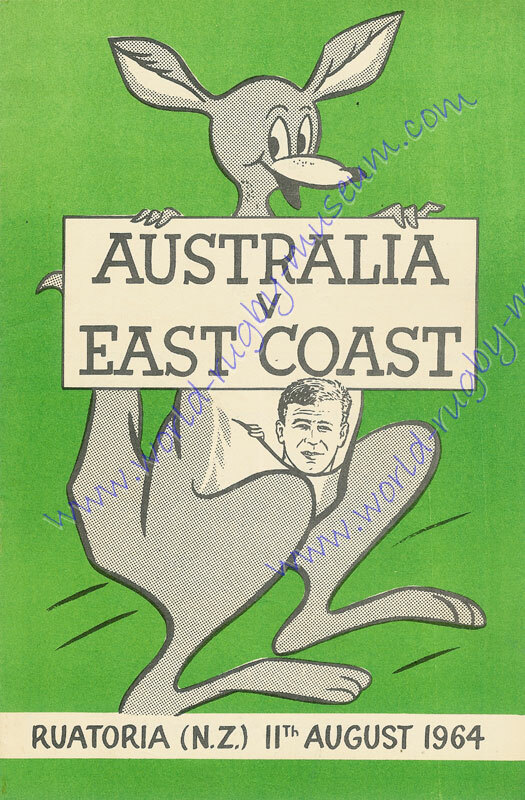 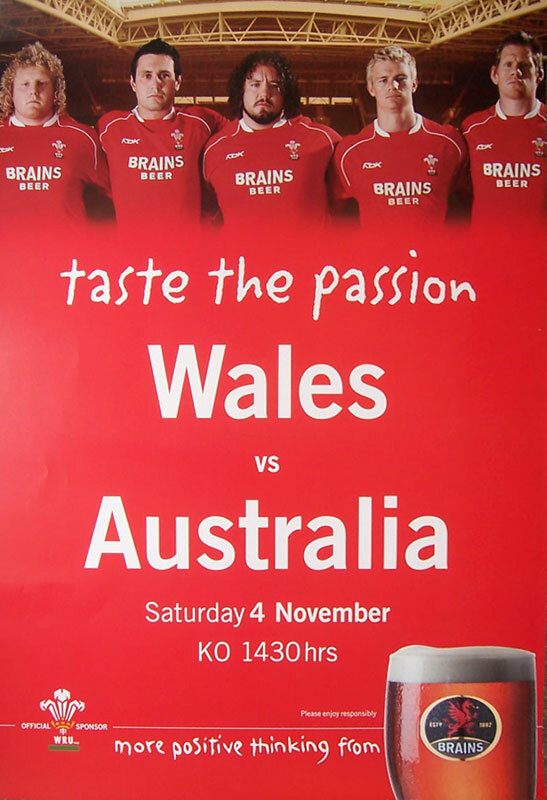 East Coast v Australia, Ruatoria, 11th August 1964 modern reproduction match advertising poster. 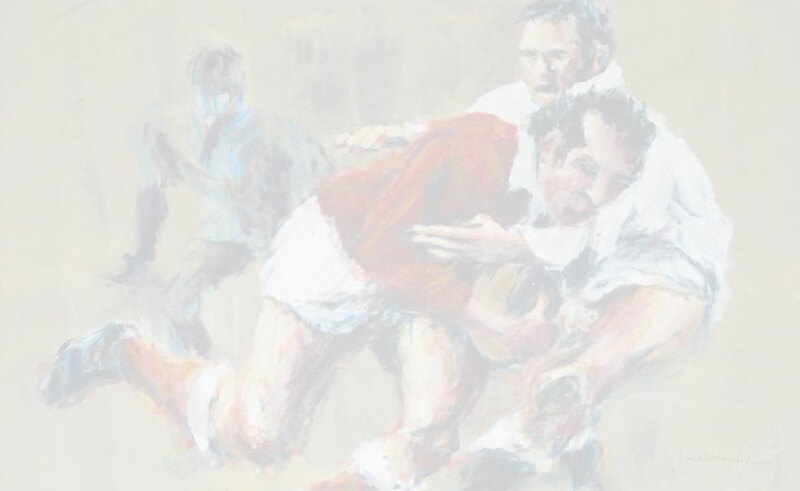 A nice wallaby illustration with a player in the pocket, size A2 (59.4cm x 42cm = 23.4" x 16.5") in excellent condition, ideal for framing. 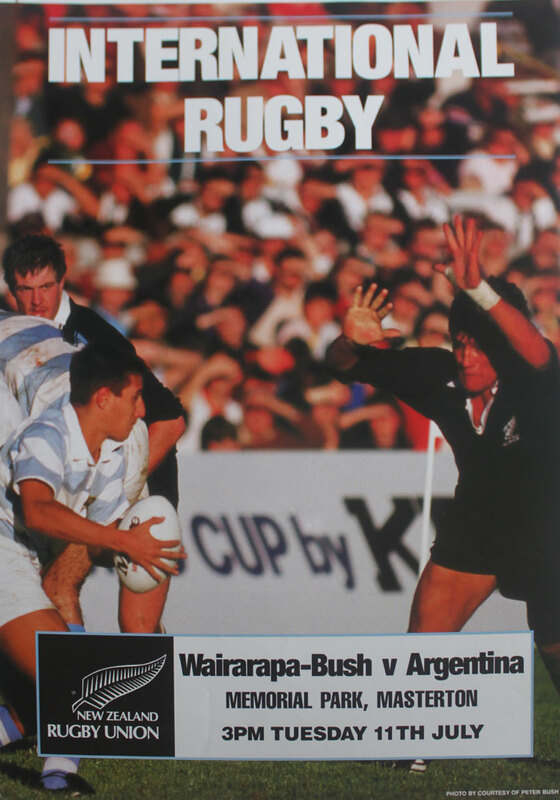 Wairarapa-Bush v Argentina 1990 match advertising poster, photo of an Argentina tour of New Zealand match with match information in a text box near the bottom, size 60cm x 42cm. 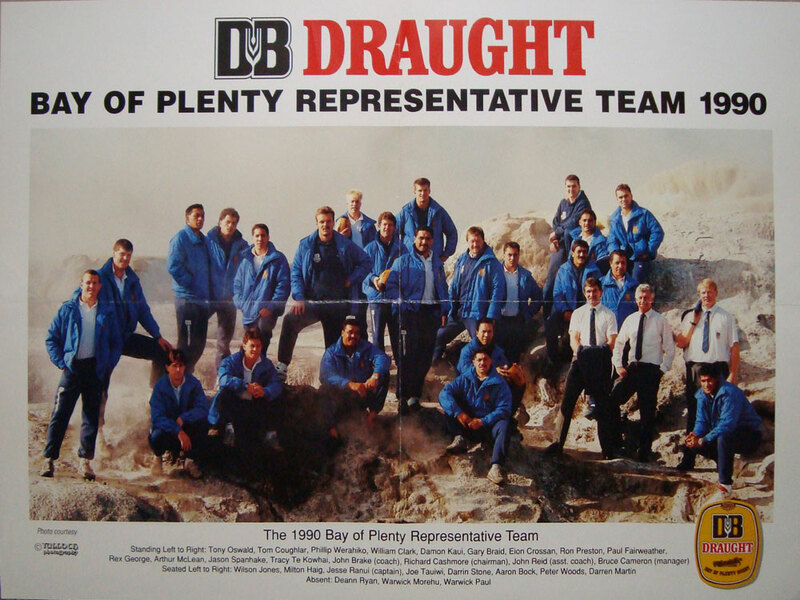 Wanganui v Australia, Spriggens Park, Wanganui, 15th September 1962 modern reproduction match advertising poster. 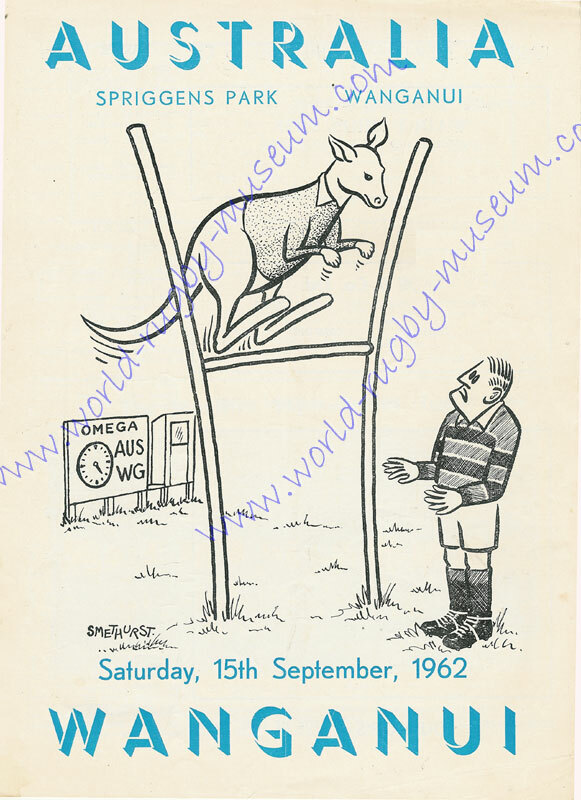 A nice comical poster with a wallaby jumping over the posts illustration, size A2 (59.4cm x 42cm = 23.4" x 16.5") in excellent condition, ideal for framing. 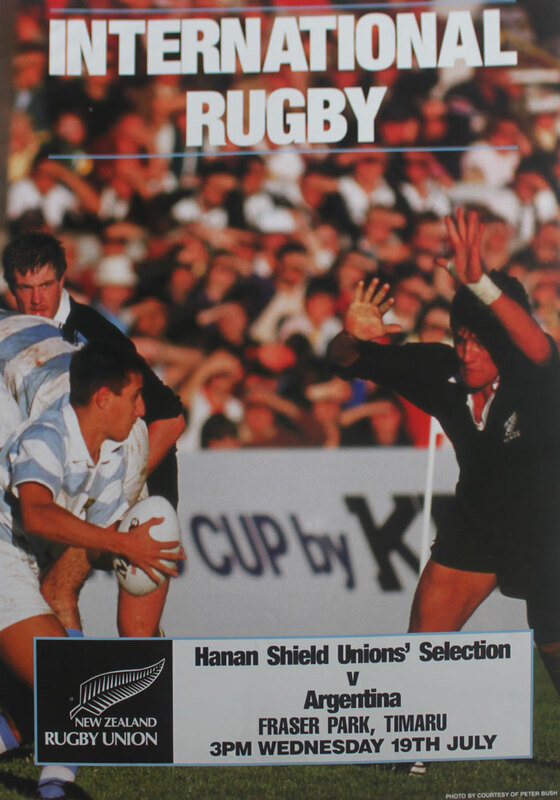 Hanan Shield Unions v Argentina 1990 match advertising poster, photo of an Argentina tour of New Zealand match with match information in a text box near the bottom, size A2, 60cm x 42cm. 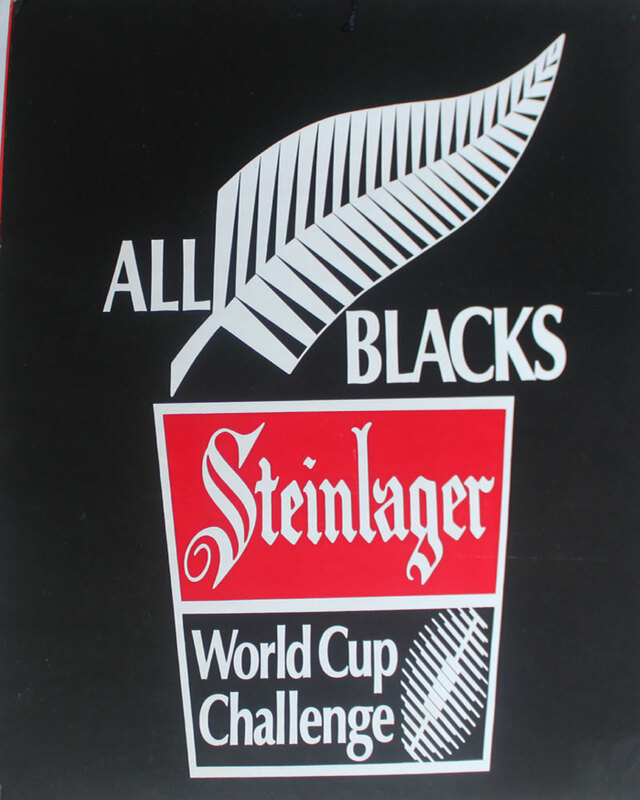 Steinlager World Cup Challenge, believed to be from 1987, large advertising card, approx size 24" x 20"
Waikato v Australia, Rugby Park, Hamilton, 9th September 1972 modern reproduction match advertising poster. 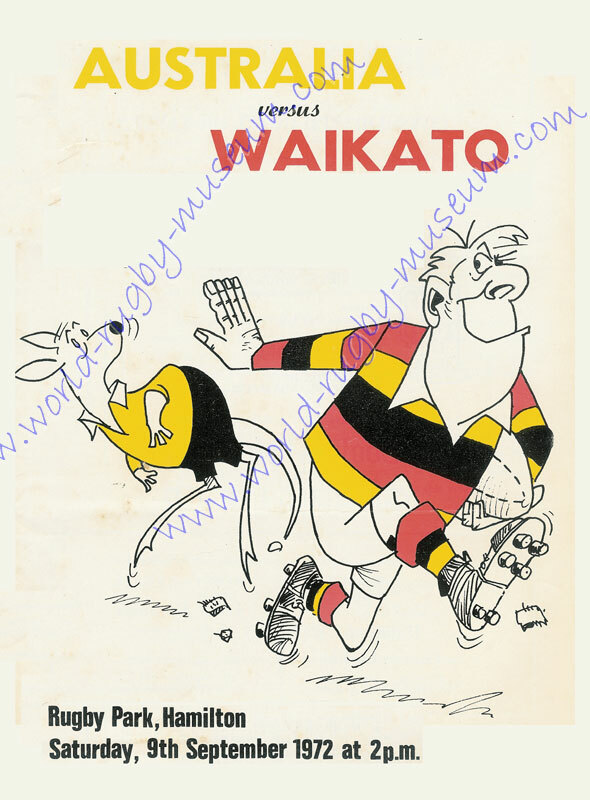 A nice comical Waikato player handing off a wallaby illustration, size A2 (59.4cm x 42cm = 23.4" x 16.5") in excellent condition, ideal for framing. 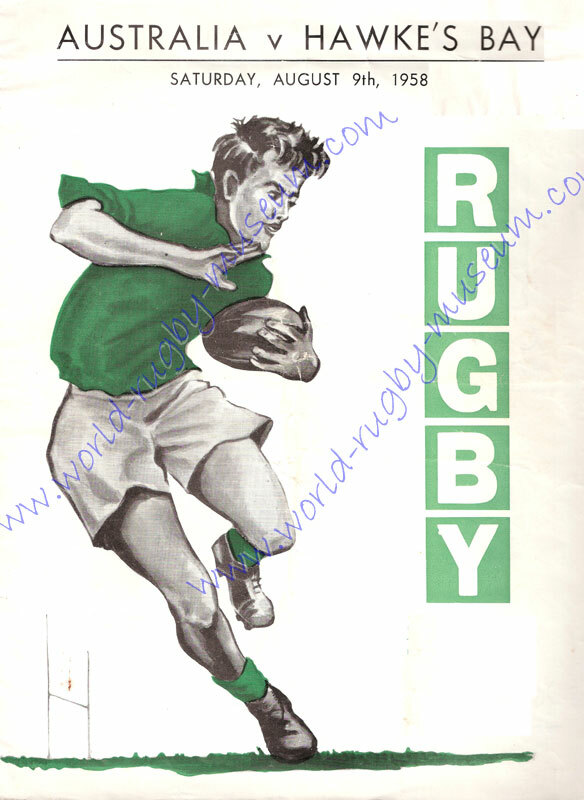 Hawkes Bay v Australia, 9th August 1958 modern reproduction match advertising poster. 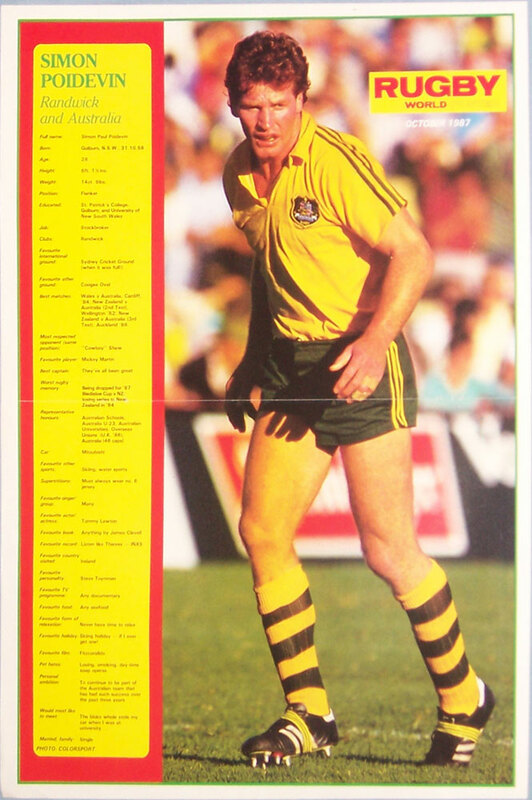 A nice illustration of a Wallaby player with the ball, size A2 (59.4cm x 42cm = 23.4" x 16.5") in excellent condition, ideal for framing. 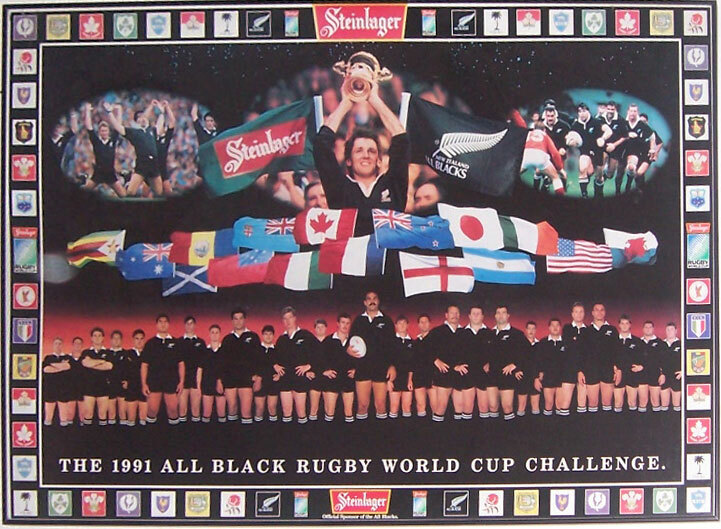 1991 - "The 1991 All Black Rugby World Cup Challenge" - Gary Whetton & squad with David Kirk above holding aloft the cup & flags of competing nations, mounted on hardboard with a light frame. 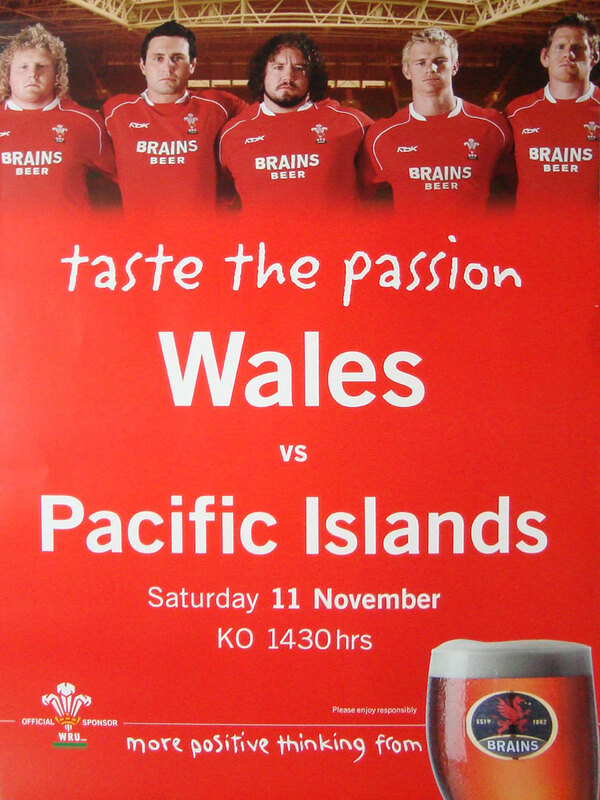 Size A1 - Please note: We are unable to post this overseas. 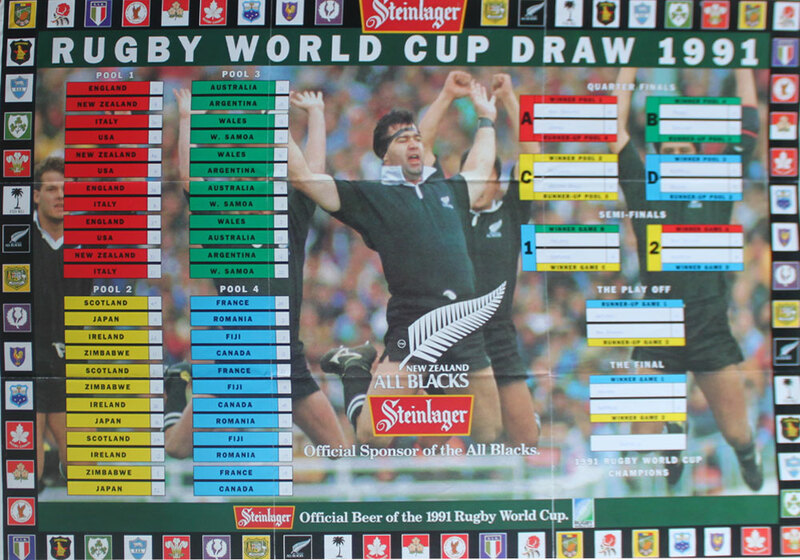 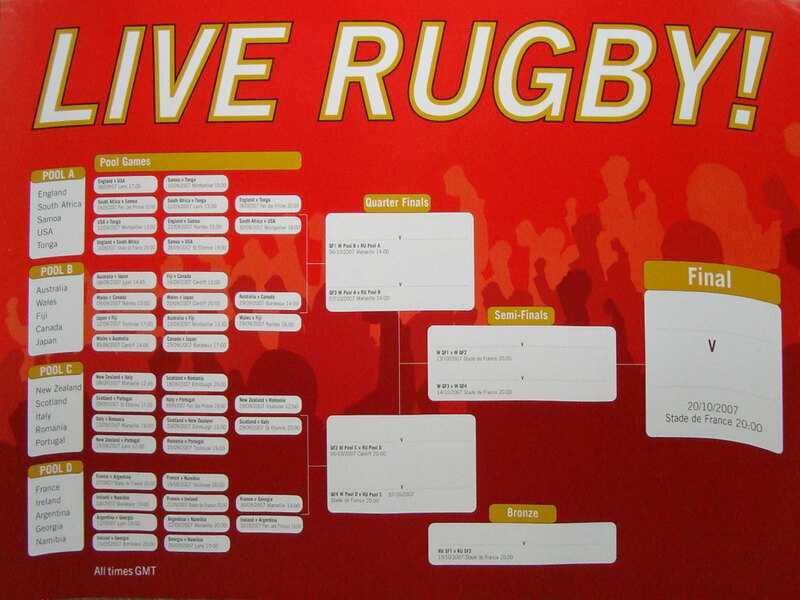 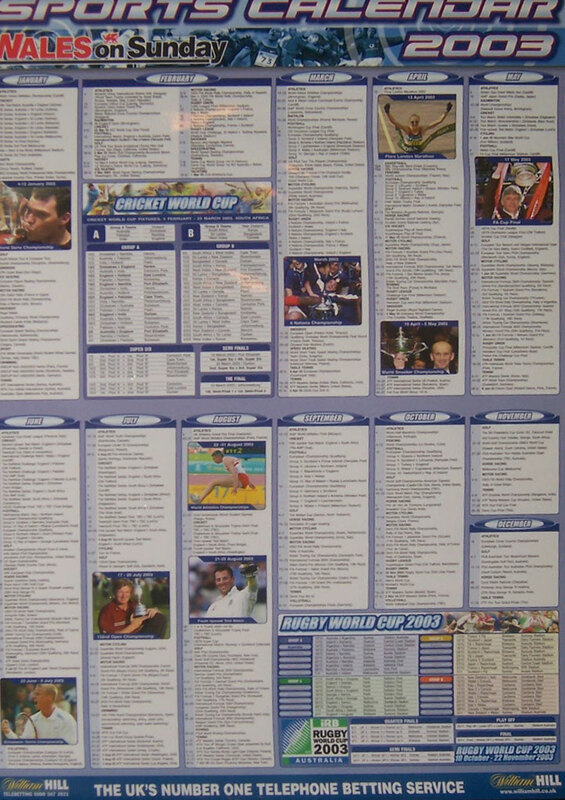 1991 - Steinlager - Rugby World Cup Draw 1991, folded, results filled in neatly (60x42). 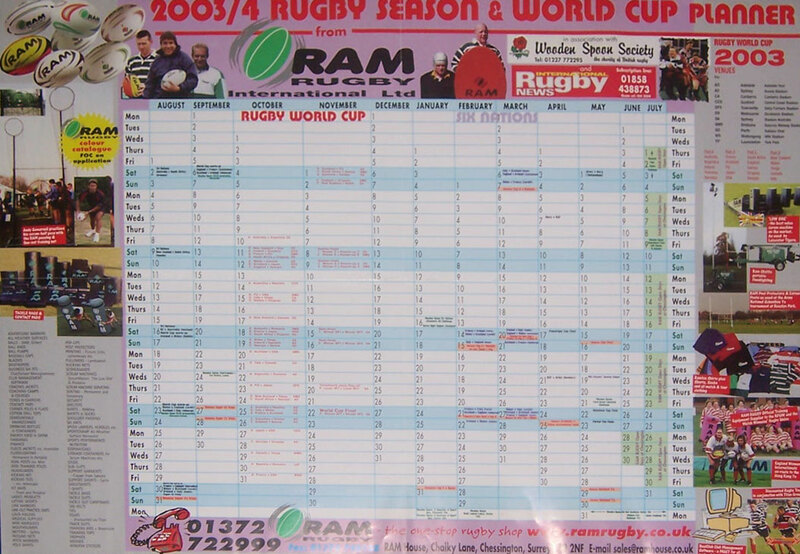 2003/4 season and RWC planner by RAM Rugby International. 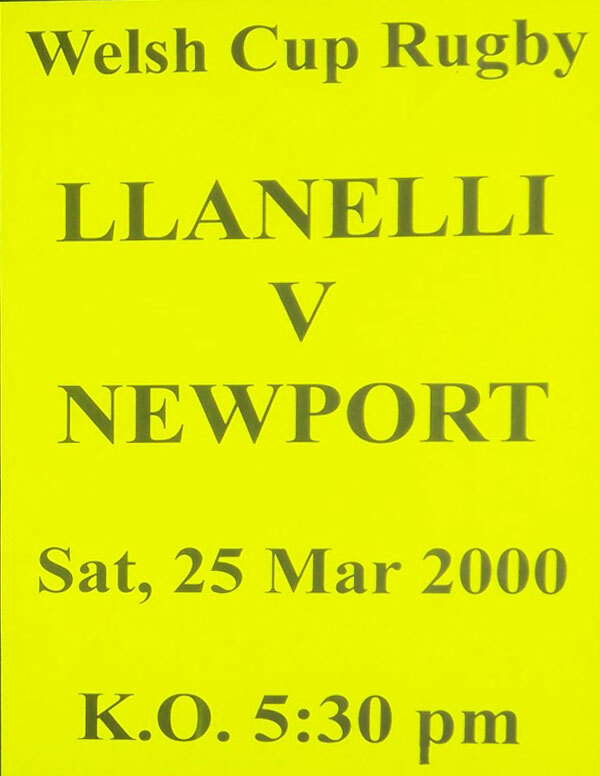 size 23" x 16" - 58 x 41cm, folded. 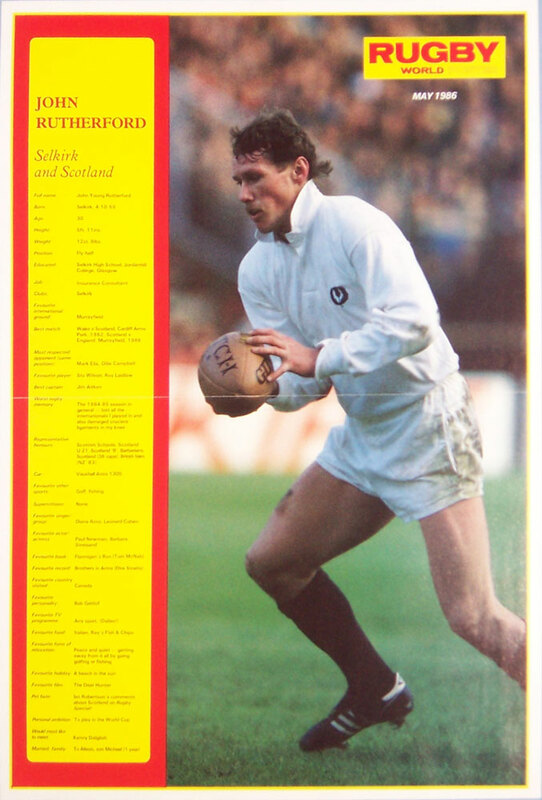 John Rutherford, Scotland, Rugby World & Post player profile series, size A3, 42cm x 29.7cm = 16.5" x 11.7, folded. 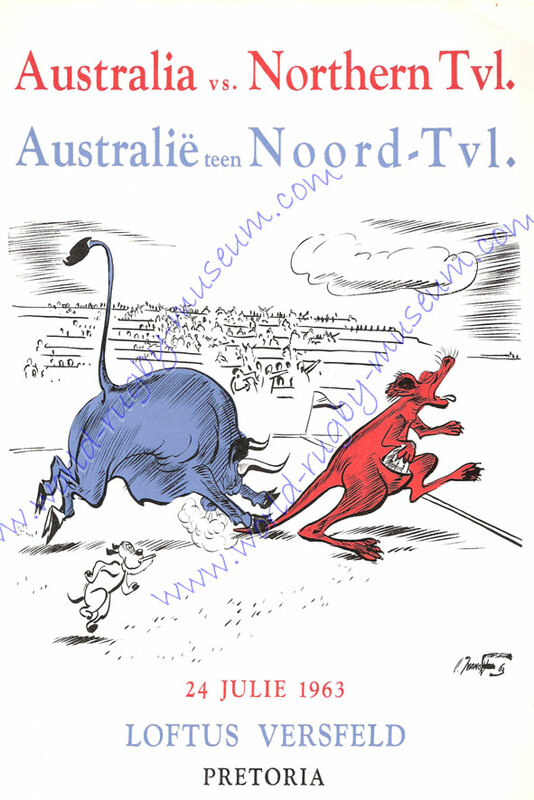 Northern Transvaal v Australia 1963 modern reproduction quality match advertising poster with superb comical illustration, size A2 (59.4cm x 42cm = 23.4" x 16.5") in excellent condition, ideal for framing. 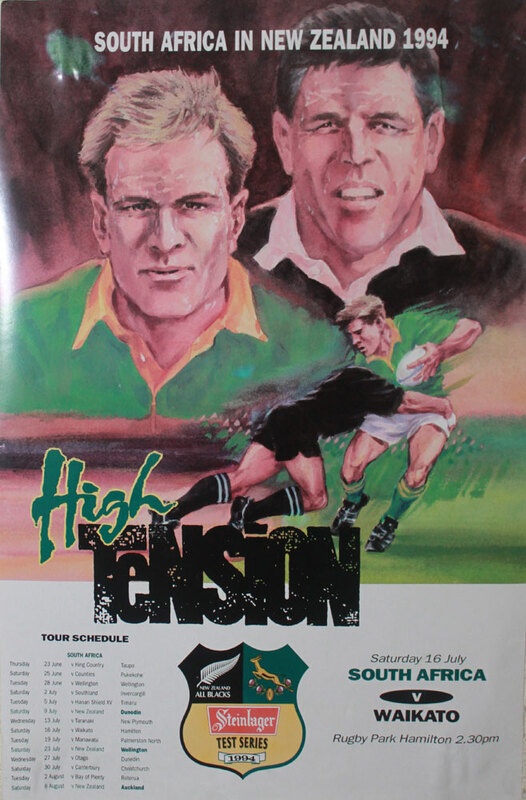 Transvaal v Australia, Ellis Park, Jo'burg, 8th July 1963 modern reproduction match advertising poster. 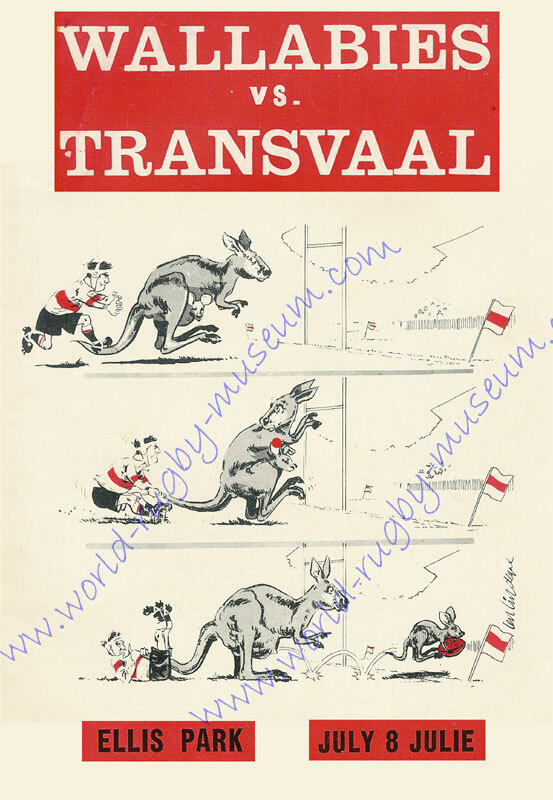 A lovely cartoon strrip wallaby illustration, size A2 (59.4cm x 42cm = 23.4" x 16.5") in excellent condition, ideal for framing. 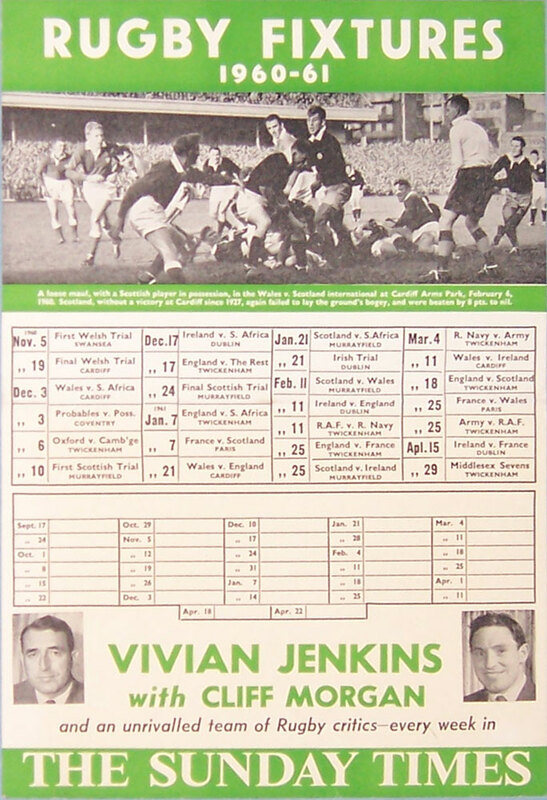 Transvaal v Barbarians, Ellis Park, Jo'burg, 10th May 1958 modern reproduction match advertising poster. 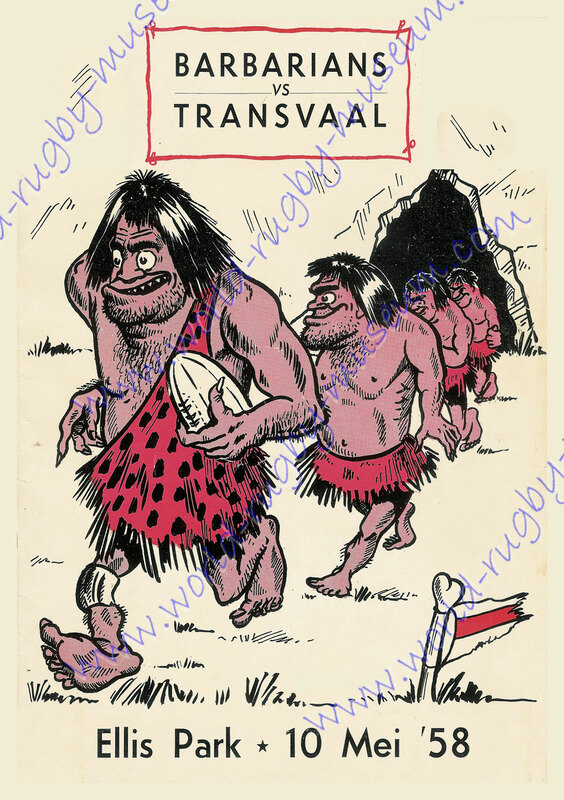 A lovely cartoon strip cavemen illustration, size A2 (59.4cm x 42cm = 23.4" x 16.5") in excellent condition / as new, will be posted in a postal tube, ideal for framing. 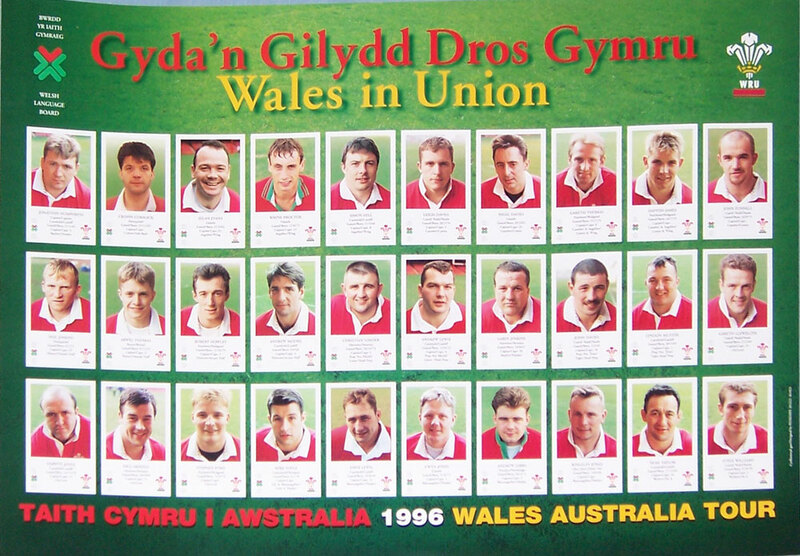 Wales tour of Australia 1996, individual photos and profiles of all players in the tour party. 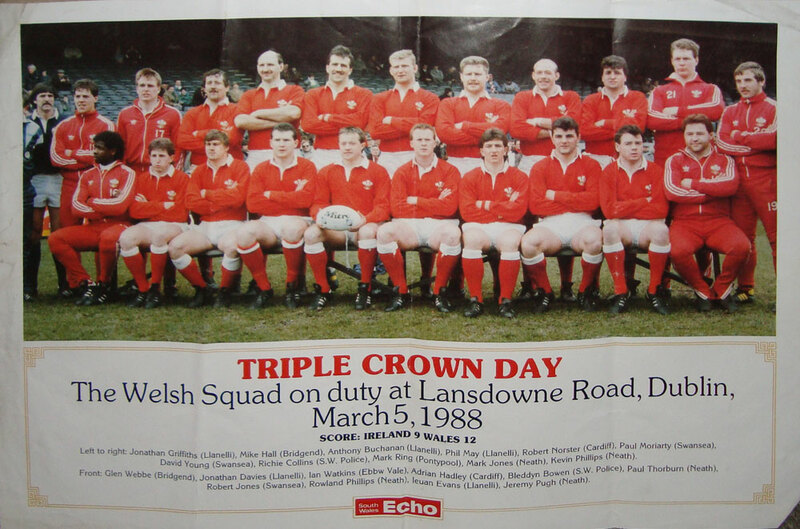 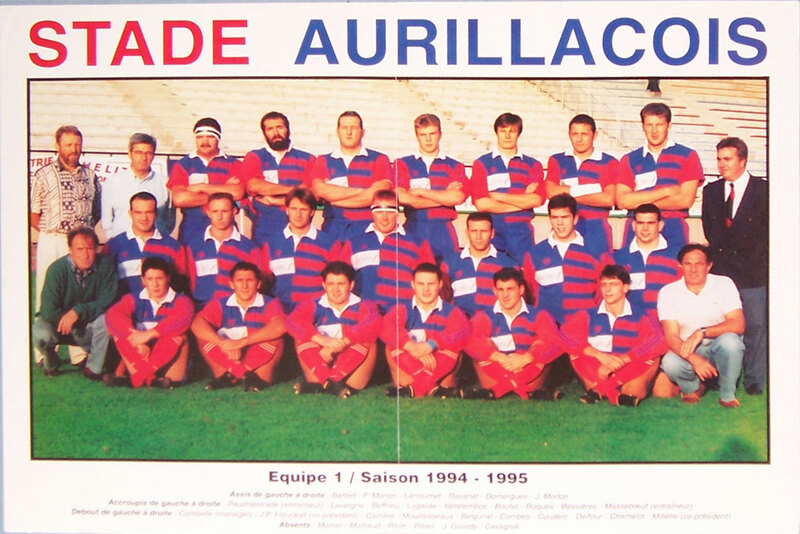 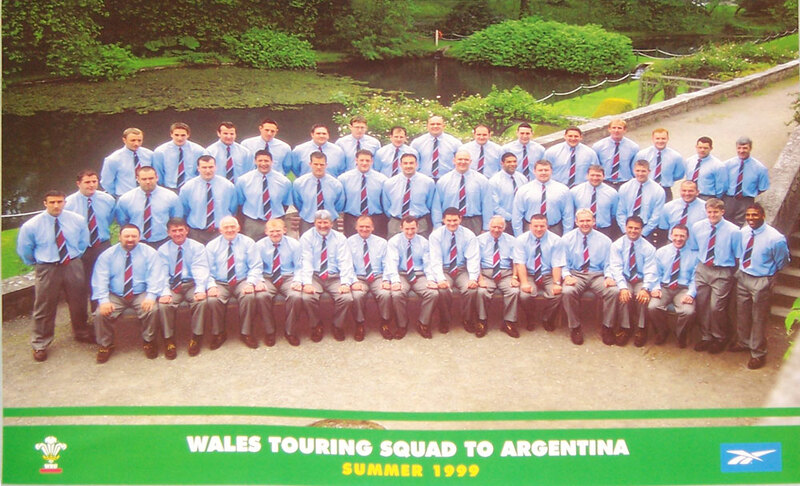 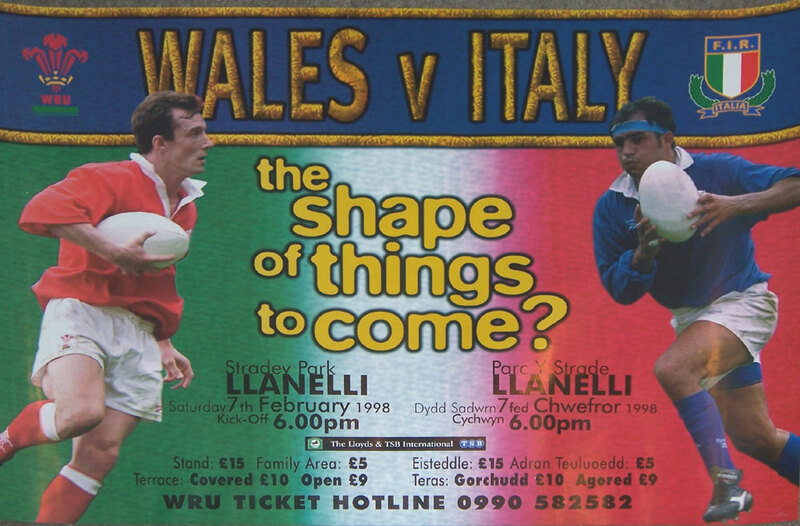 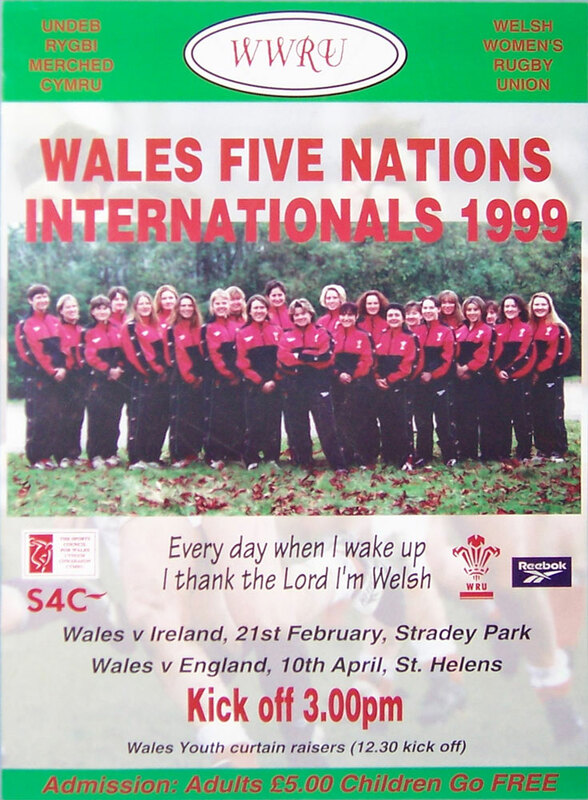 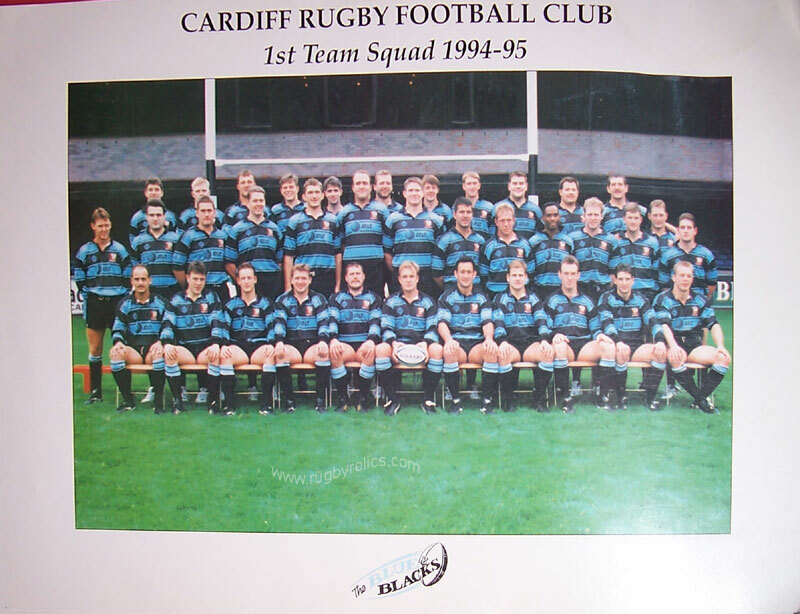 Size A2, 59.4cm x 42cm = 23.4" x 16.5"
Wales touring squad to Argentina 1999, colour squad photo, size A2, 59.4cm x 42cm = 23.4" x 16.5"
Wales v Italy, 7th Feb 1998, Stradey Park, pre-match advertising poster, size A2, 59.4cm x 42cm = 23.4" x 16.5"
World Junior Championships in Wales 1999 advertising poster, single fold across centre. 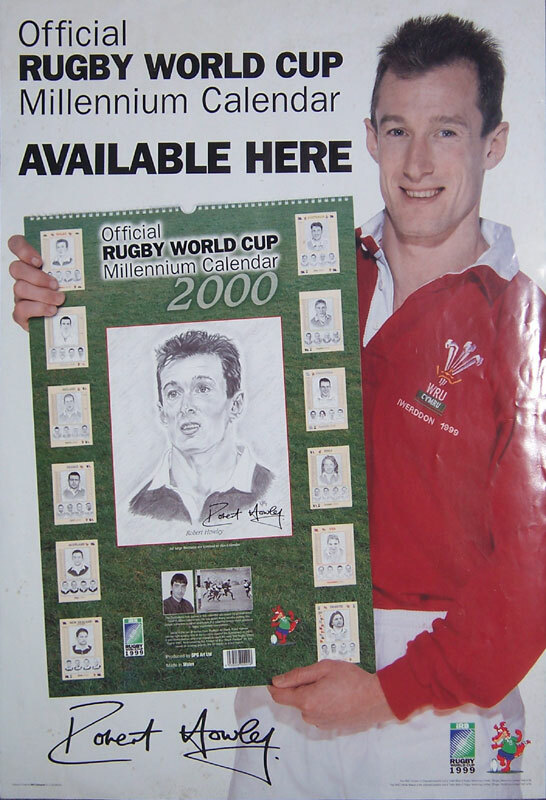 size 23" x 17" - 58cm x 42cm. 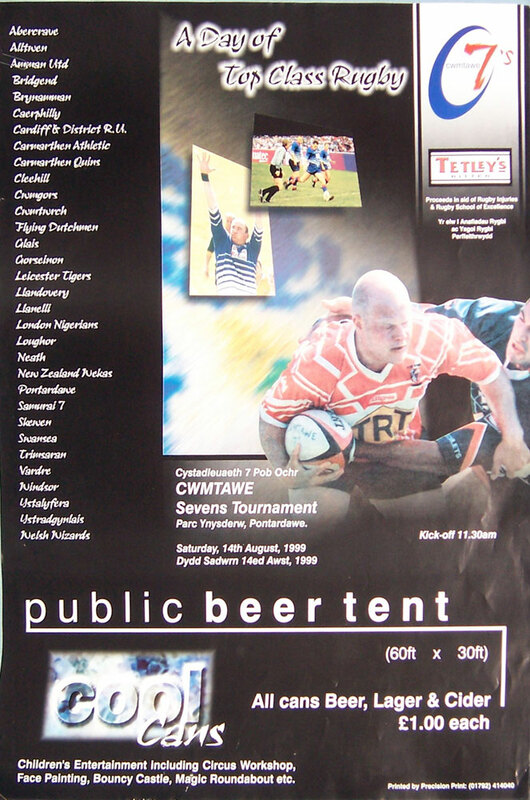 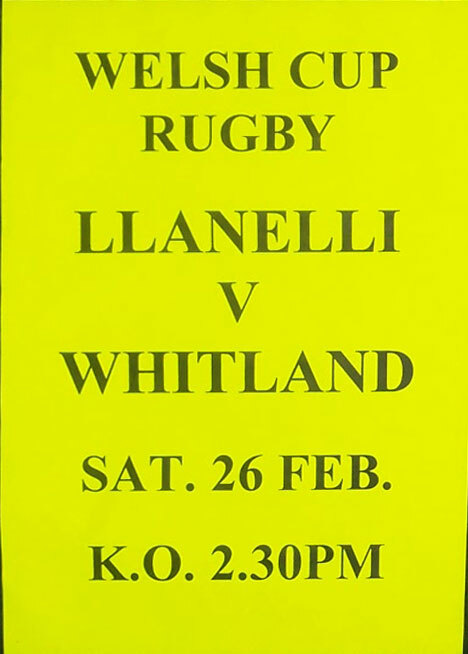 Cwmtawe Sevens 1999, pre-match advertising poster, competing teams include Aberavon, Neath, Llanelli & Swansea, size A2, 59.4cm x 42cm = 23.4" x 16.5"
Iestyn Harris "Welcome to Wales" poster, published by the Western mail this poster is dated for the Wales v Argentina 10th Nov 2001 match, it has been folded but is otherwise in good condition, double sided with photos of iestyn in Wales RL, Warrington, Leeds and Cardiff kit, size A2, 59.4cm x 42cm = 23.4" x 16.5"
Salute to Rugby - facsimile signatures of leading rugby personalities at the Aberavon centenary dinner in 1976, A3 size - 40cm x 27cm. 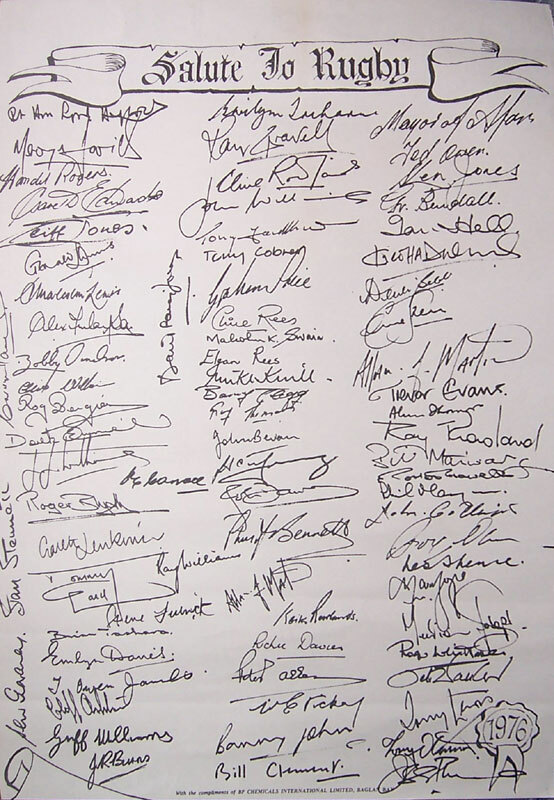 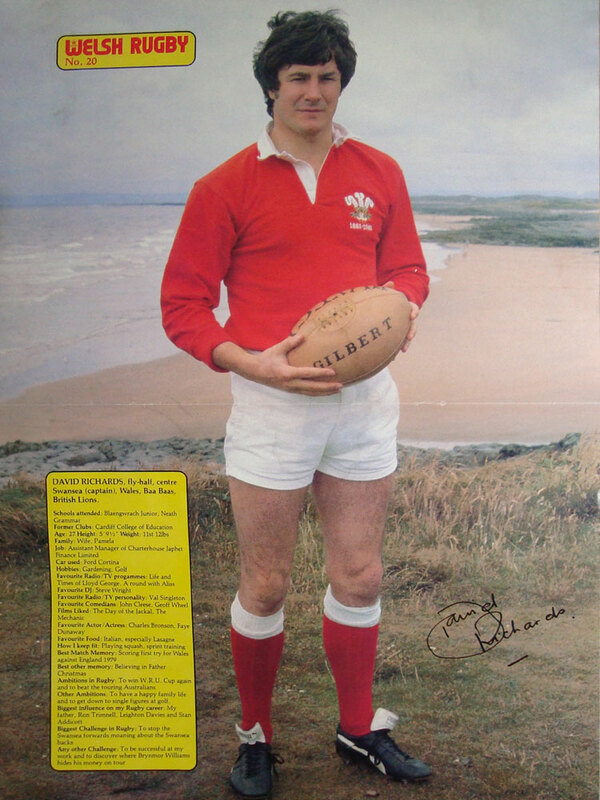 Not signed by Dai Richards of Rugby Relics who was wearing the London Welsh jersey in the parade of clubs !!!! 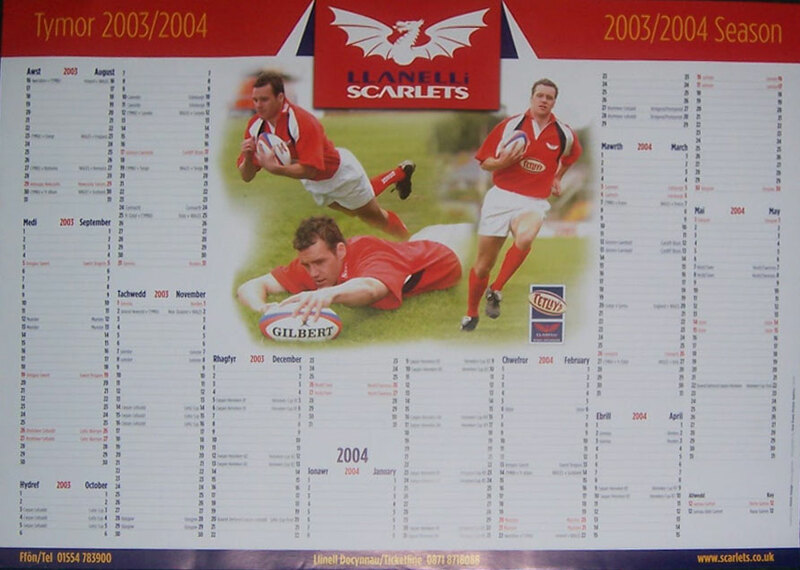 Llanelli RFC Fixture List 2000-01, includes a central montage of Scarlets heroes down the years, size 23" x 16" - 59 x 41cm. 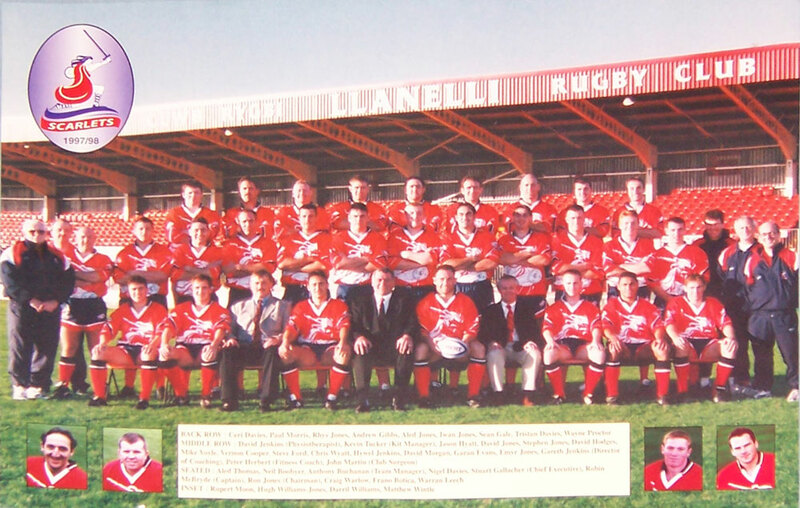 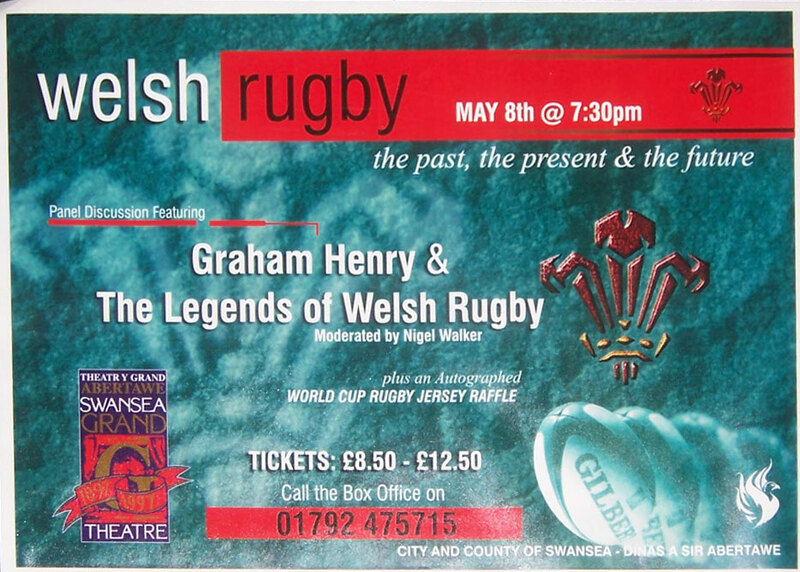 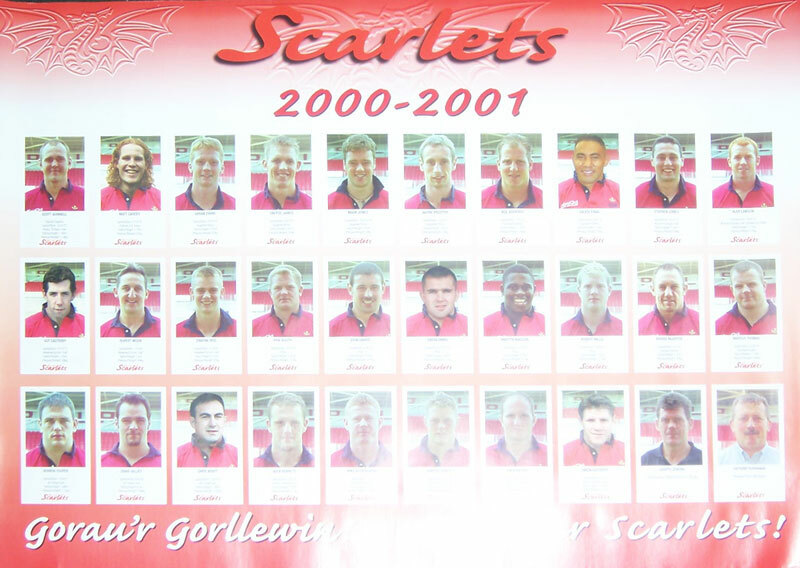 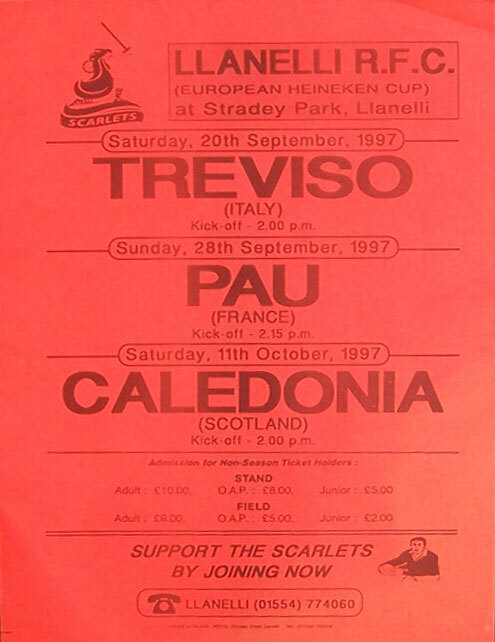 Scarlets 2000-1 - official printed poster of Scarlets 2000-01 card set issued at 2000 Eisteddfod in Llanelli. 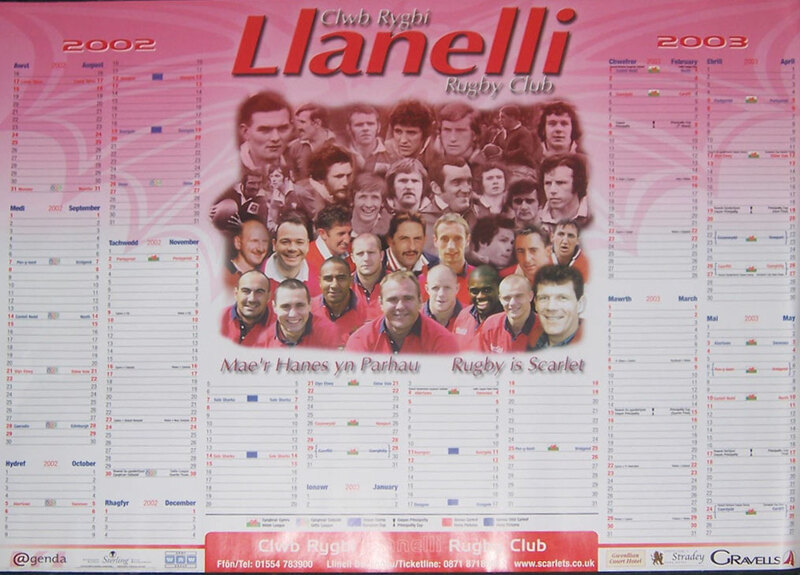 Llanelli wallchart/calendar 2002-03 with central montage of Llanelli players, size 23" x 16" - 58 x 41cm. 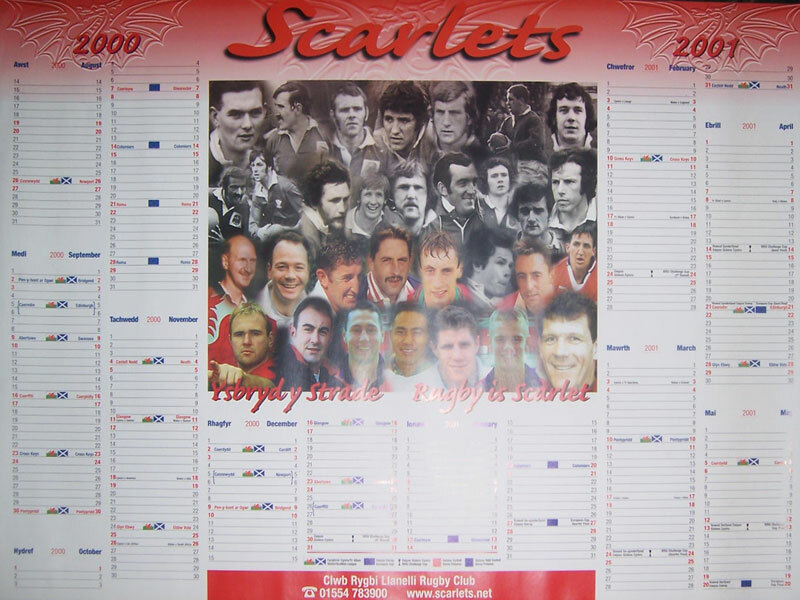 Llanelli wallchart/calendar 2003-04 with central photo of Llanelli players, size 23" x 16" - 58 x 41cm. 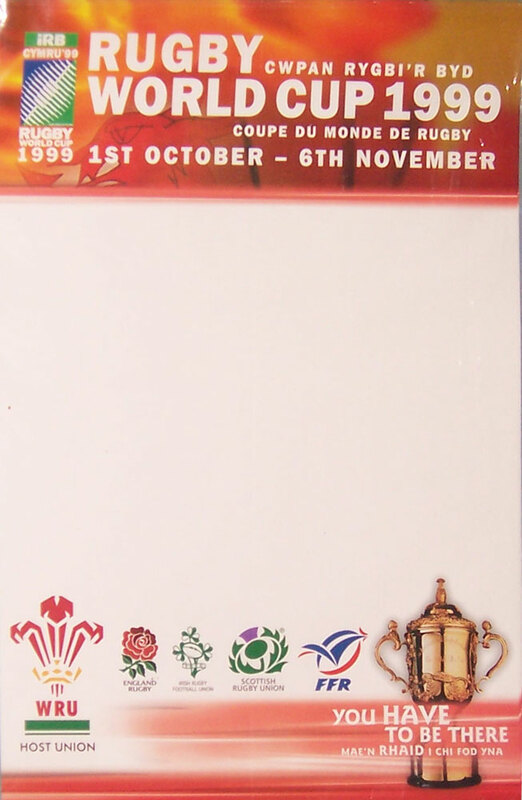 Wales on Sunday Sports Calendar 2003, size 23" x 16" - 58cm x 41cm. 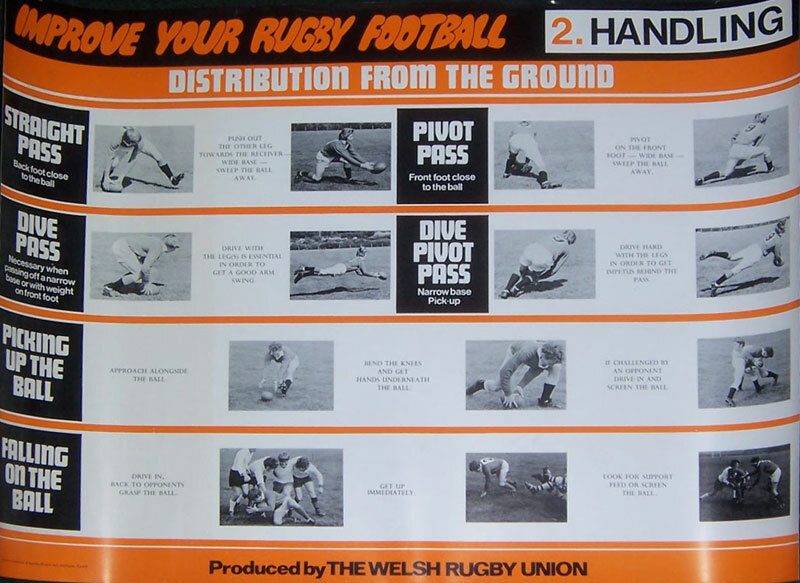 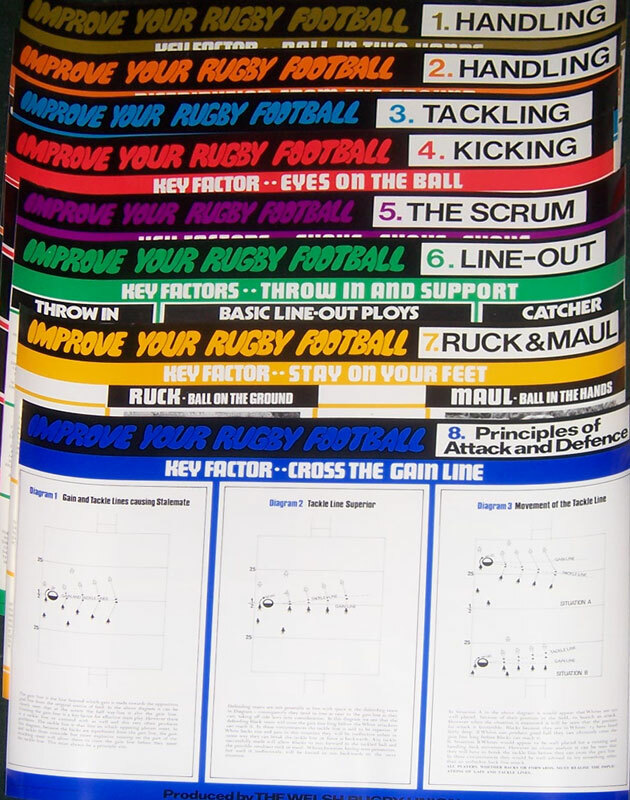 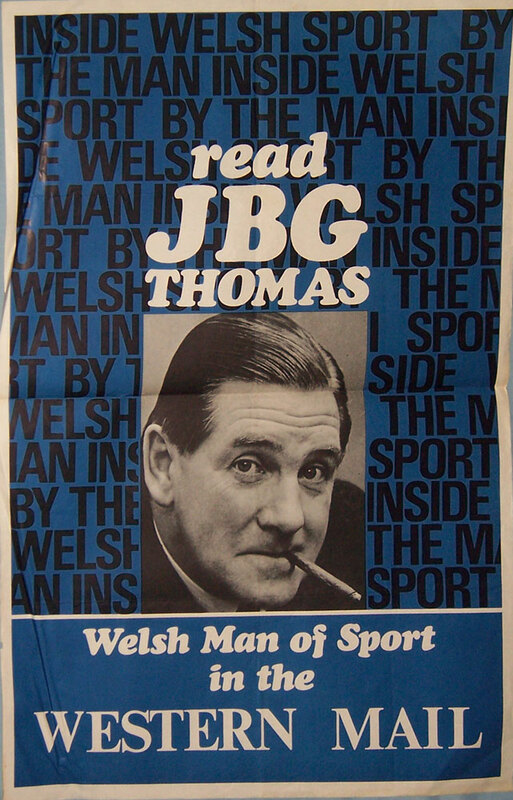 "Improve Your Rugby Football" series of 8 posters published by the Welsh Rugby Union in approx 1975. 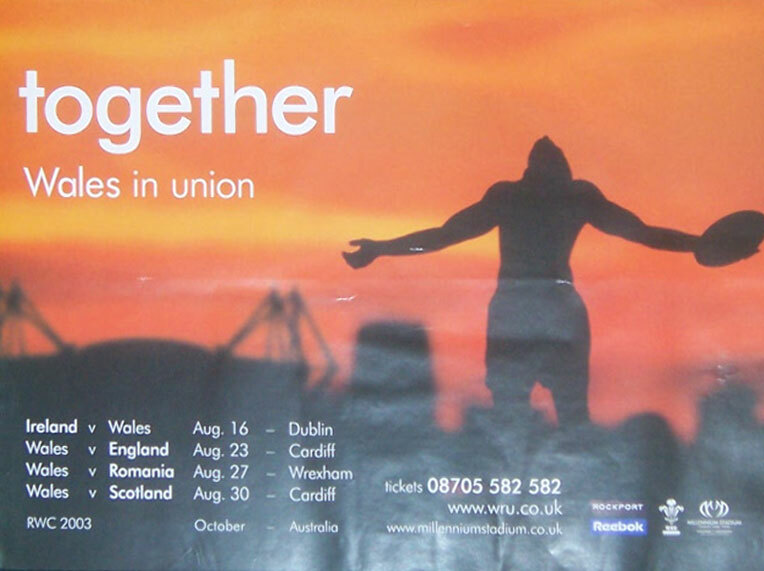 See illustrations for titles of individual posters etc. 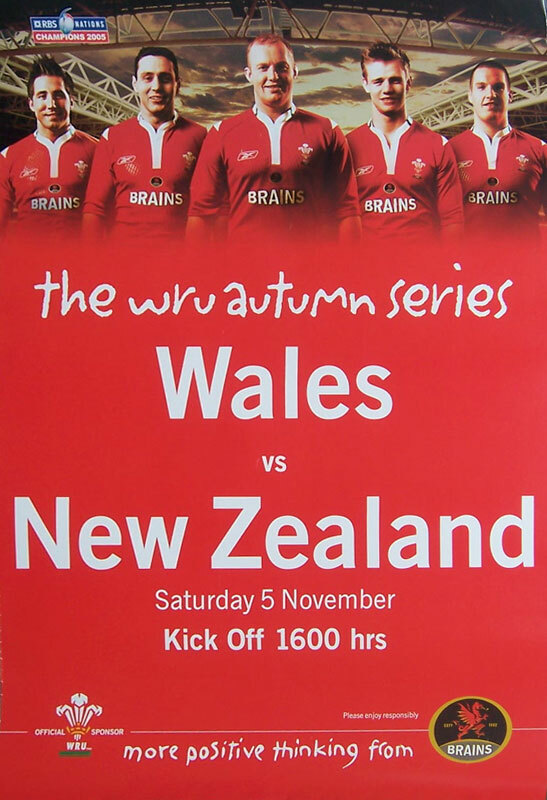 Each poster measures 22" x 17" - 56cm x 43cm - Sold as a set of 8. 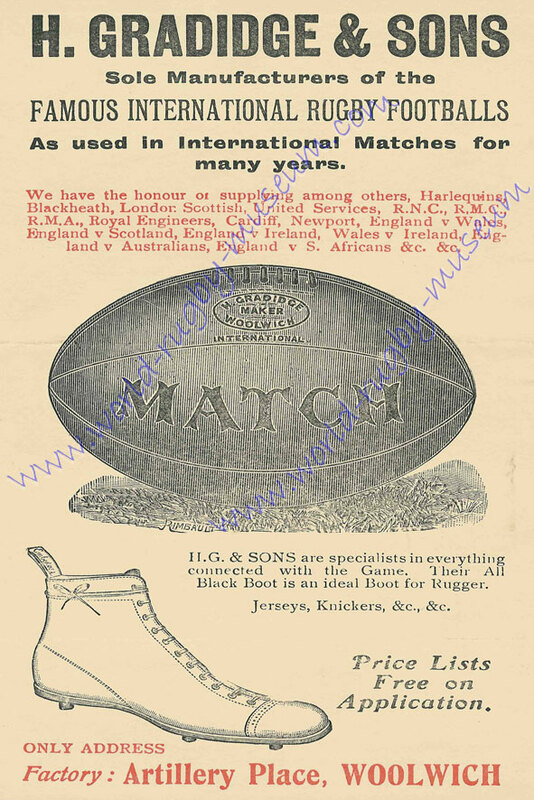 A modern reproduction poster, size A2 (59.4cm x 42cm = 23.4" x 16.5") of a 1912 Gradidge advertisement for balls & boots. 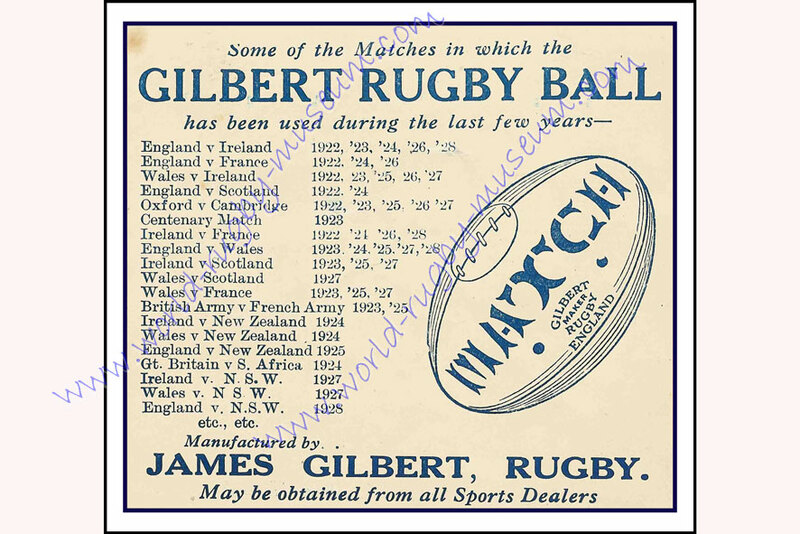 A modern reproduction poster, size A2 (59.4cm x 42cm = 23.4" x 16.5") of a Gilbert ball advertisement 1928. 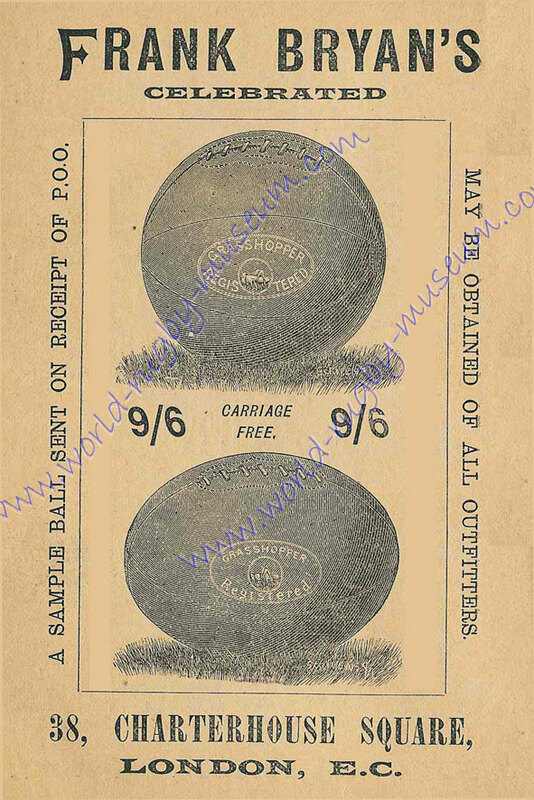 A modern reproduction poster, size A2 (59.4cm x 42cm = 23.4" x 16.5") of a Bryan's advertisement for rugby and soccer balls 1896. 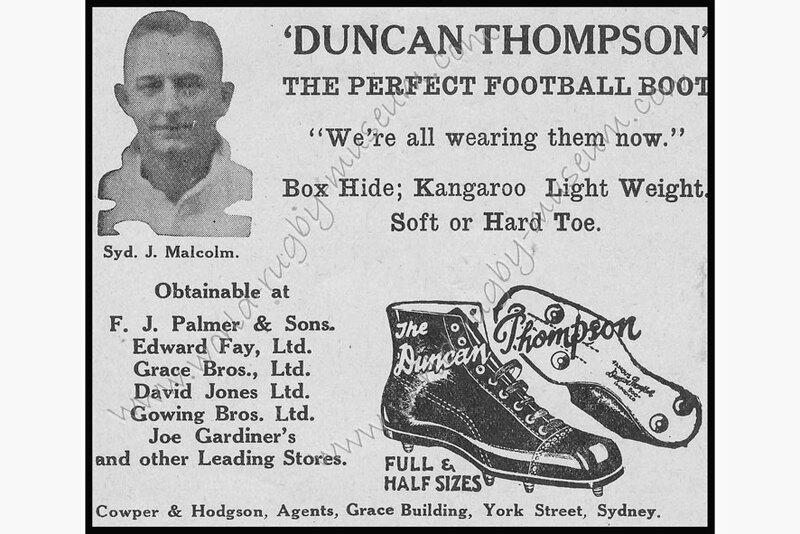 A modern reproduction poster, size A2 (59.4cm x 42cm = 23.4" x 16.5") of a Kangaroo Hide Boot advertisement 1934. 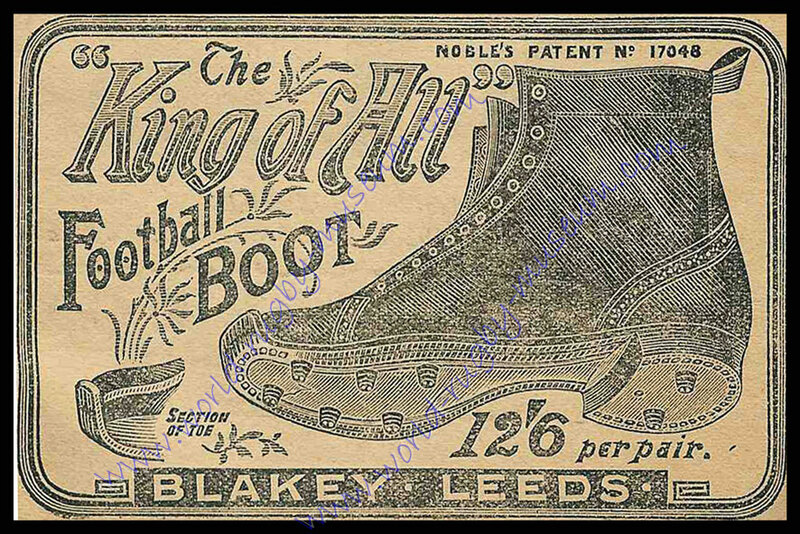 A modern reproduction poster, size A2 (59.4cm x 42cm = 23.4" x 16.5") of a 'King of All Football Boot' advertisement 1896. 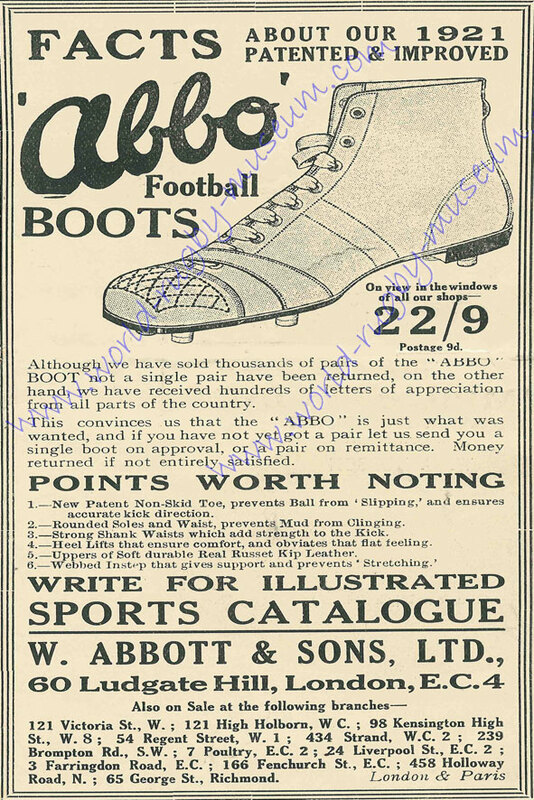 A modern reproduction poster, size A2 (59.4cm x 42cm = 23.4" x 16.5") of an'Abbo Boots' advertisement 1922. 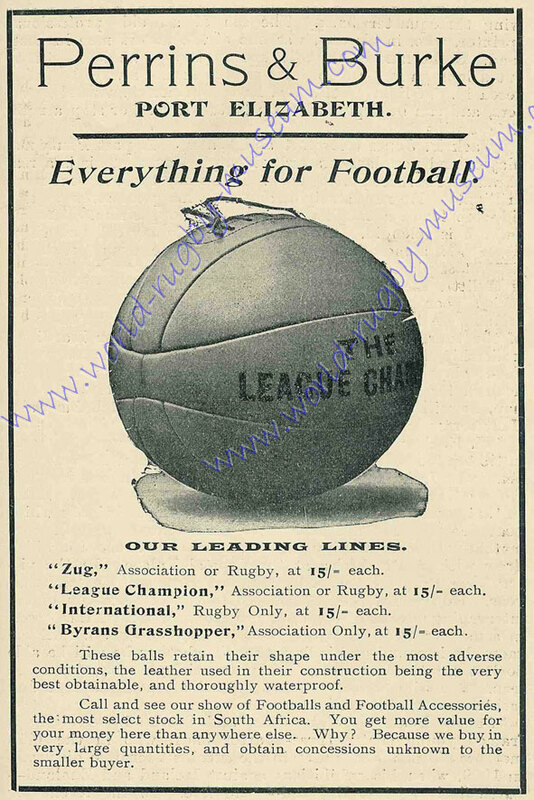 A modern reproduction poster, size A2 (59.4cm x 42cm = 23.4" x 16.5") of a 'Perrins & Burke' ball advertisement 1910. 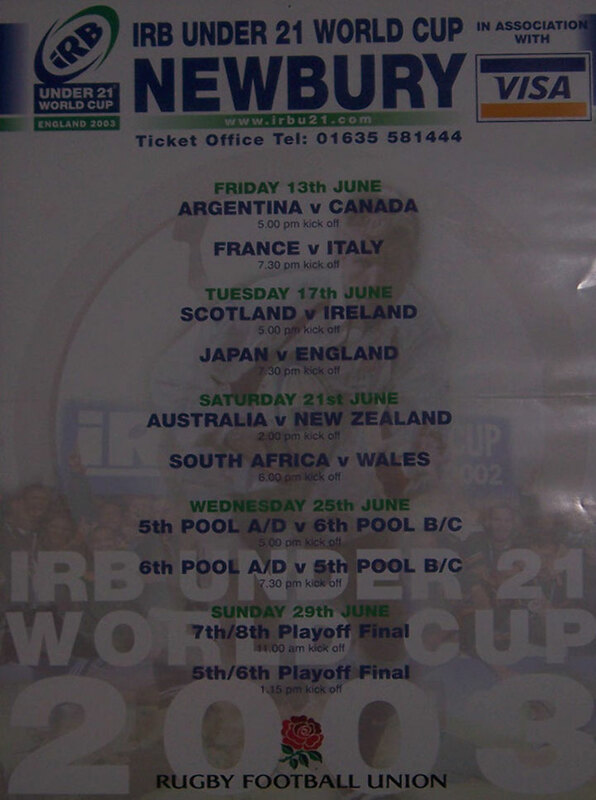 A group of 10 miscellaneous match and event advertising posters similar to above selection A3/A4 size.